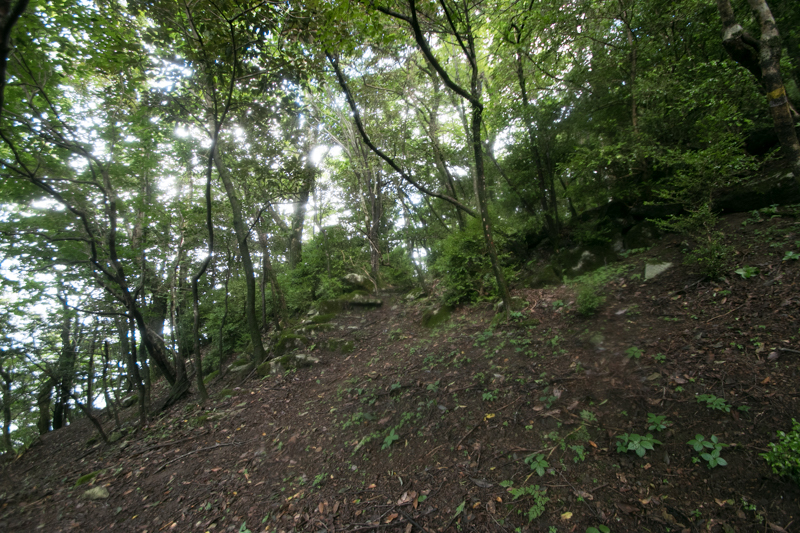 Koshosan Castle (古処山城) is built over the peak and halfway of Koshosan mountain, one of about 860 meter above sea level at the center of current Fukuoka prefecture. 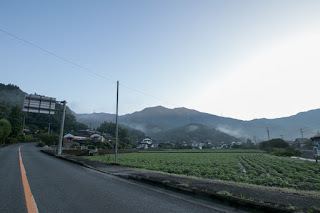 Koshosan mountain forms Kosho-Umami mountains along with Heizan mountain and Umami-yama mountain which are almost same height as Koshosan, which separate Chikuho area and Kurume area. 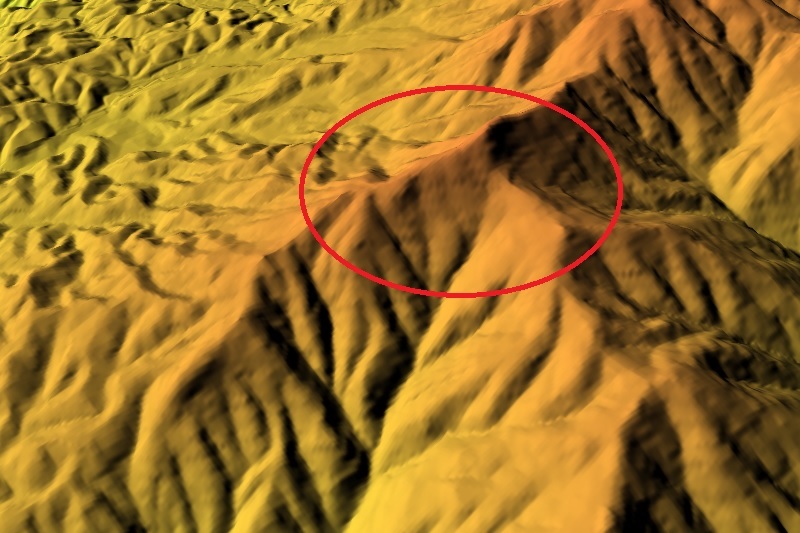 This impressive line of three mountain is well seen from surrounding area because of its prominent height. 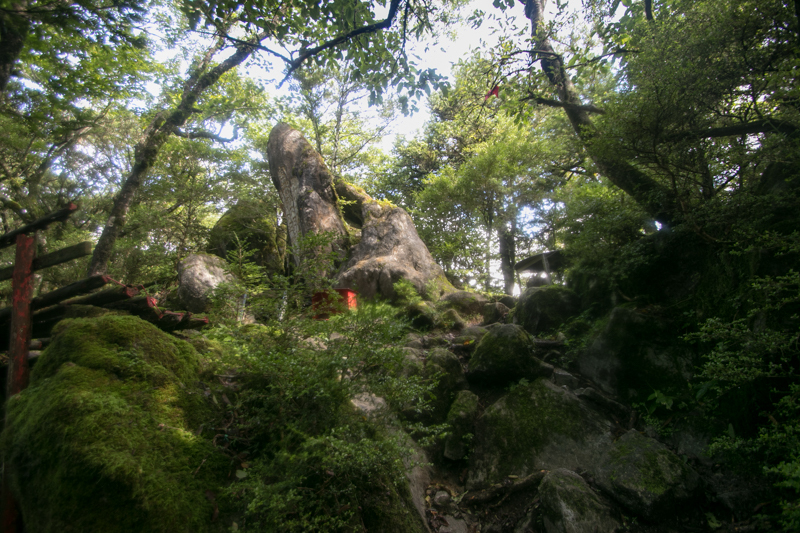 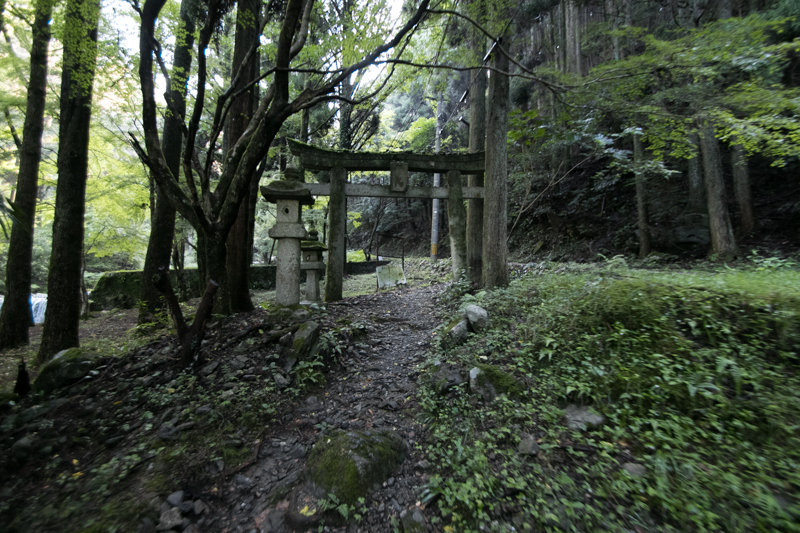 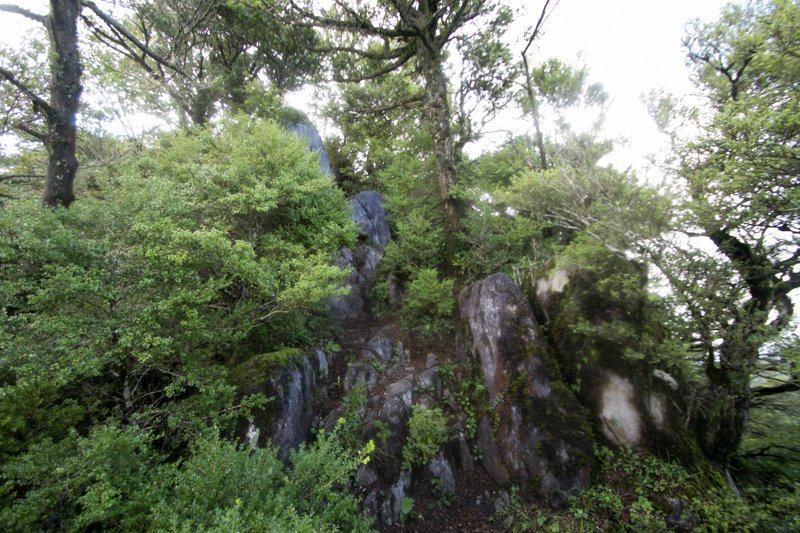 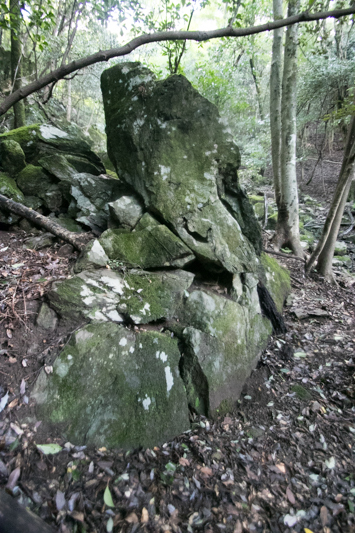 Historically Koshosan mountain had prospered as a sacred place of mountain Buddhism, and recently was nominated as Mountain Heritage of Japan. 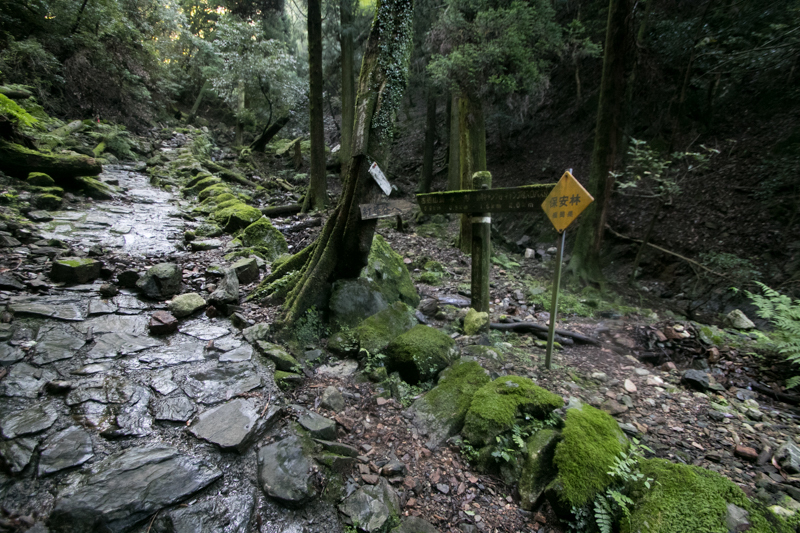 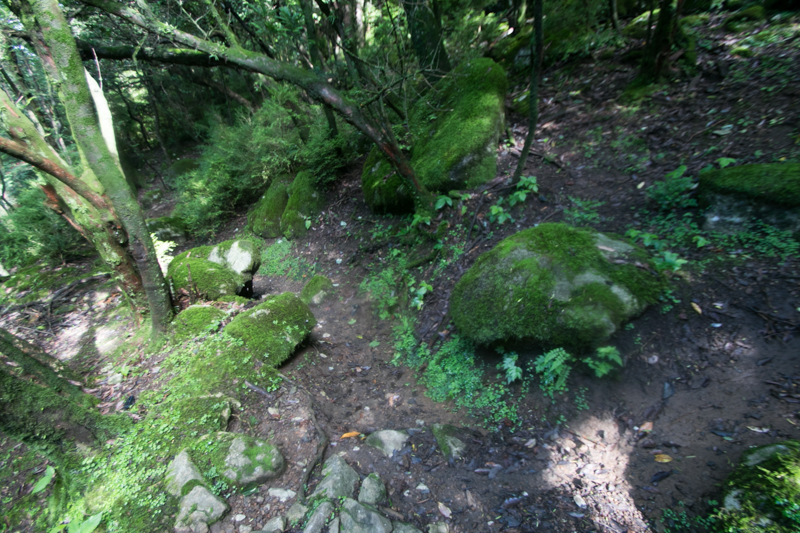 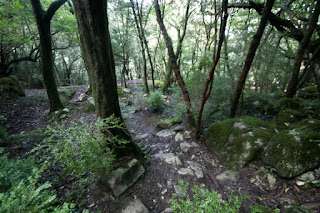 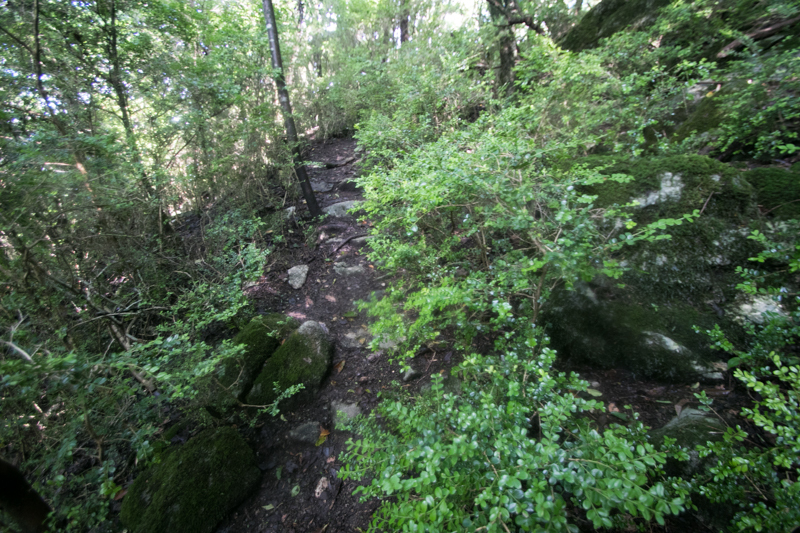 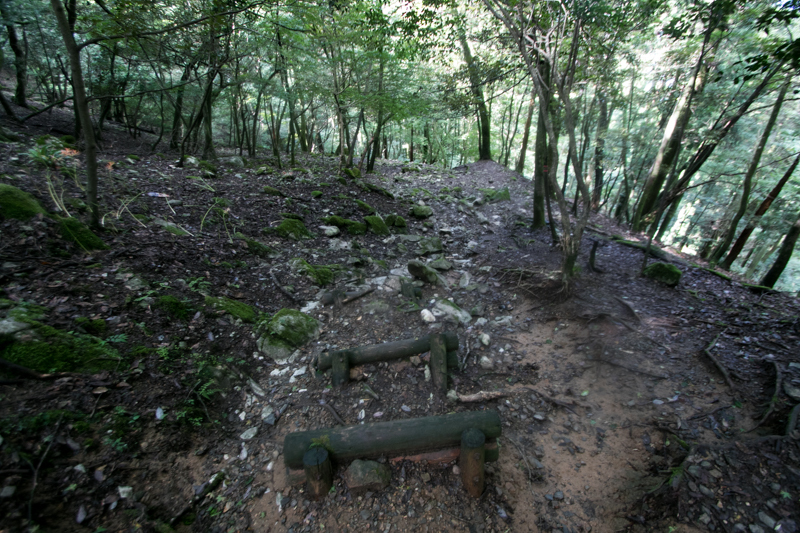 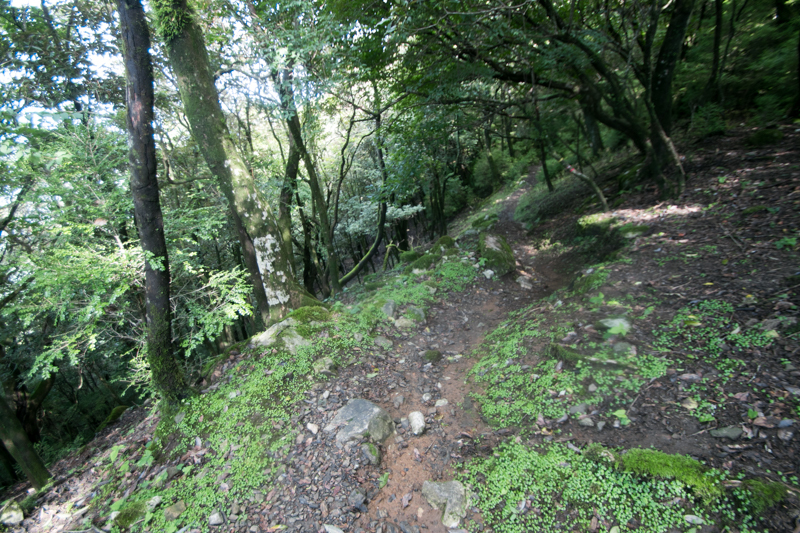 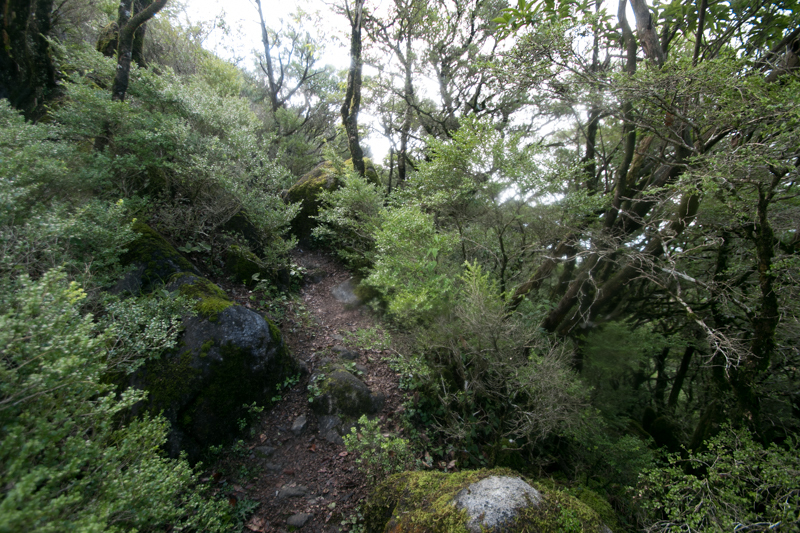 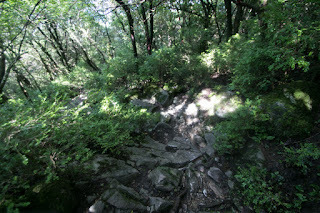 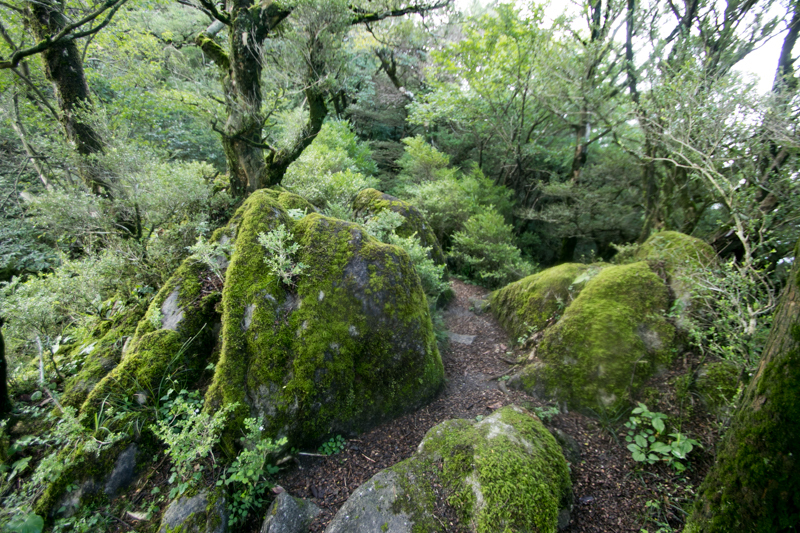 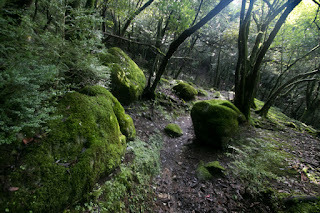 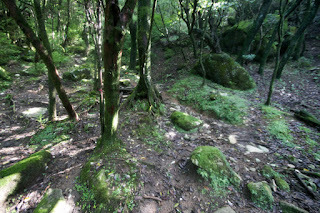 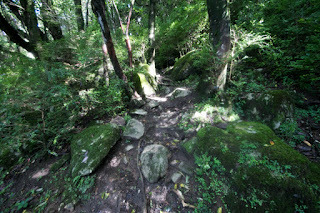 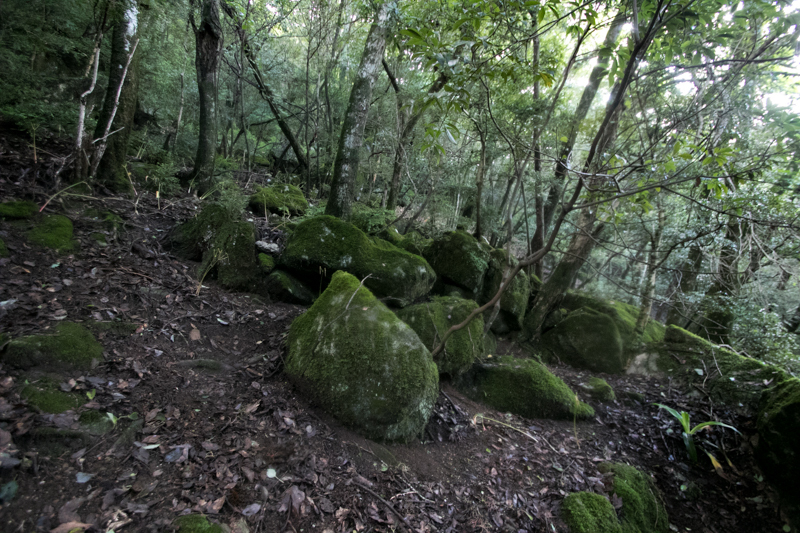 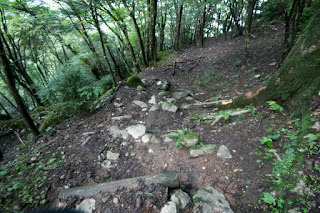 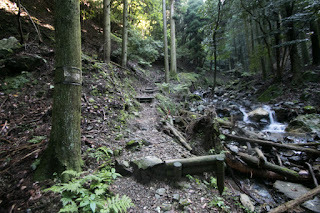 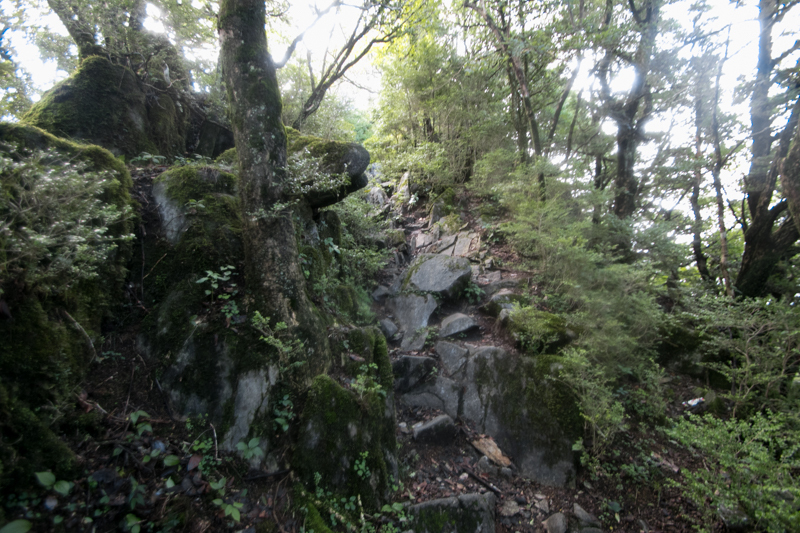 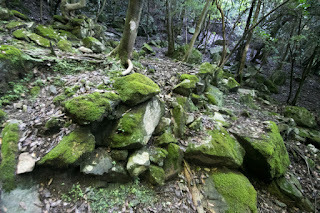 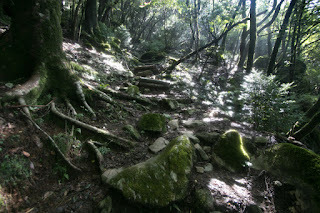 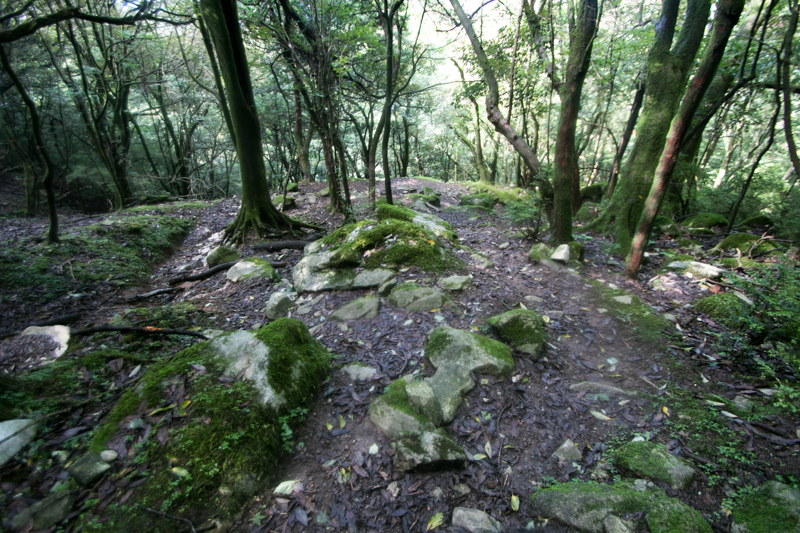 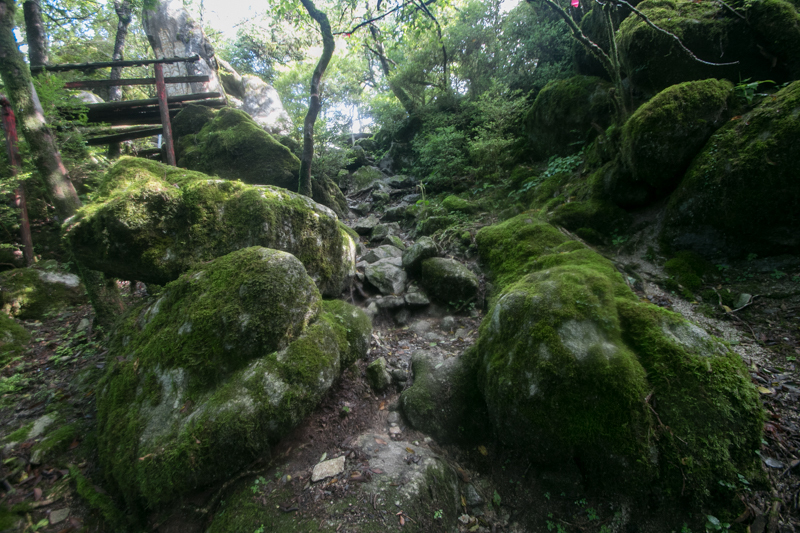 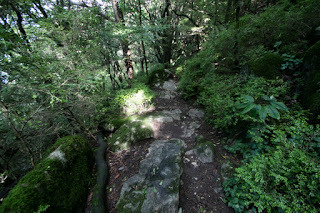 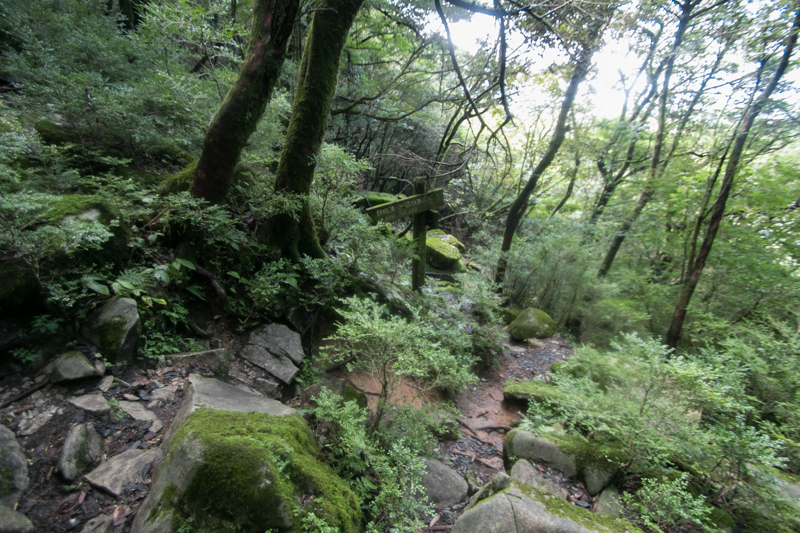 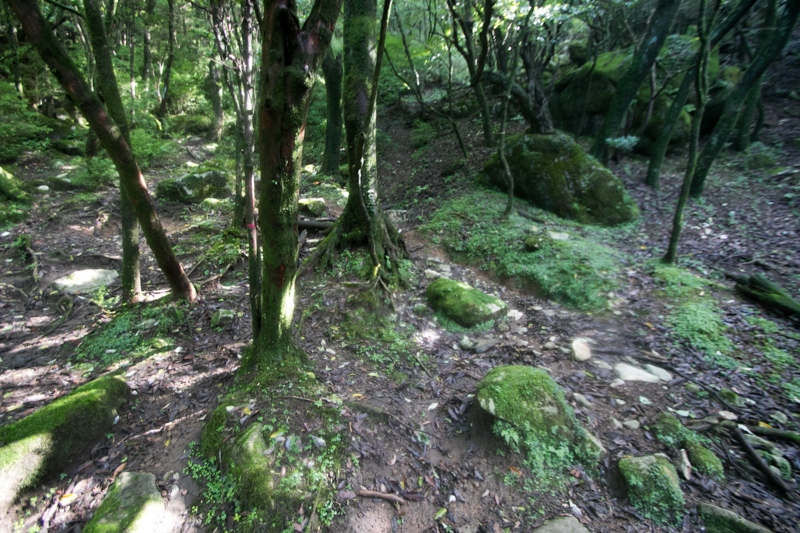 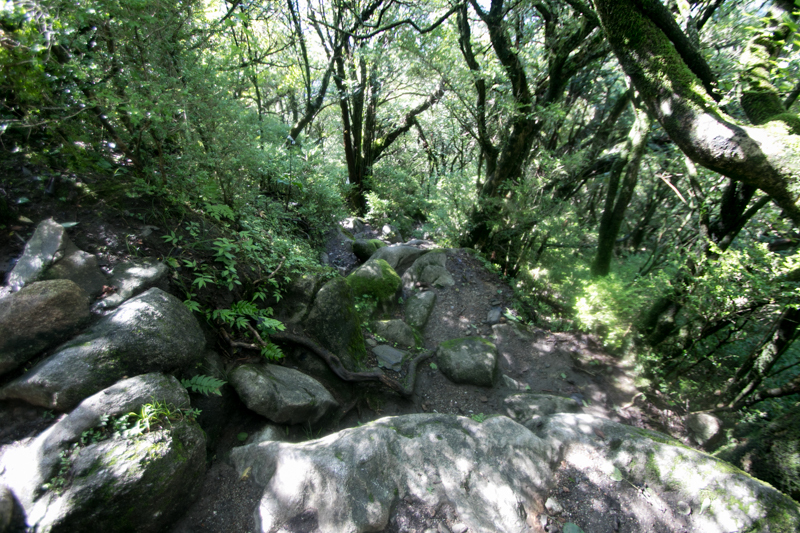 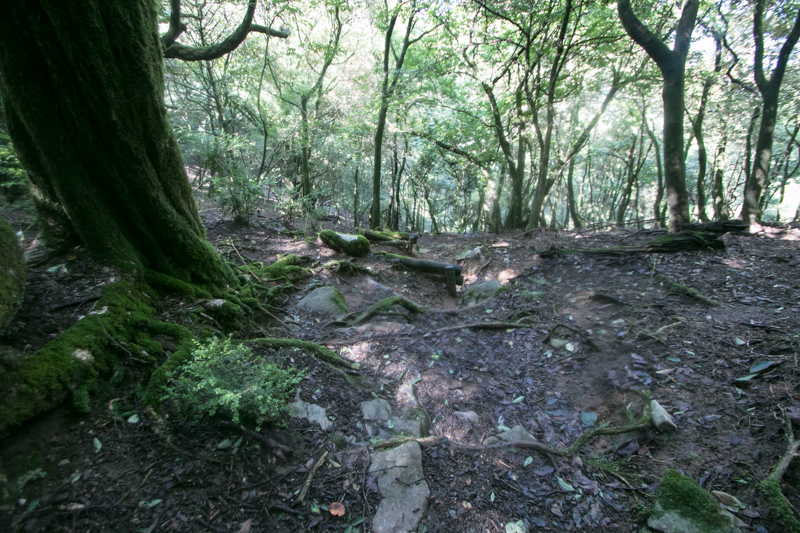 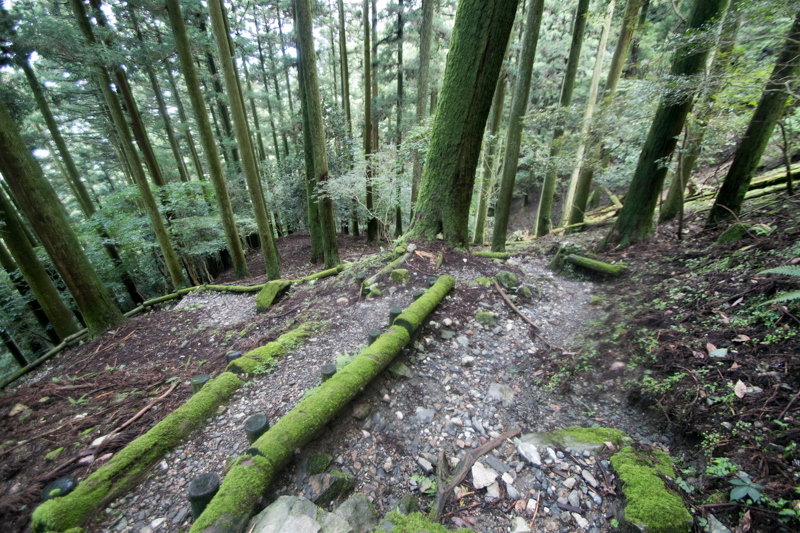 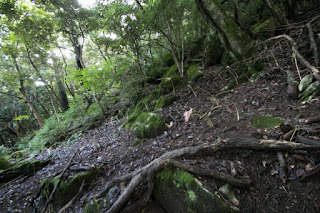 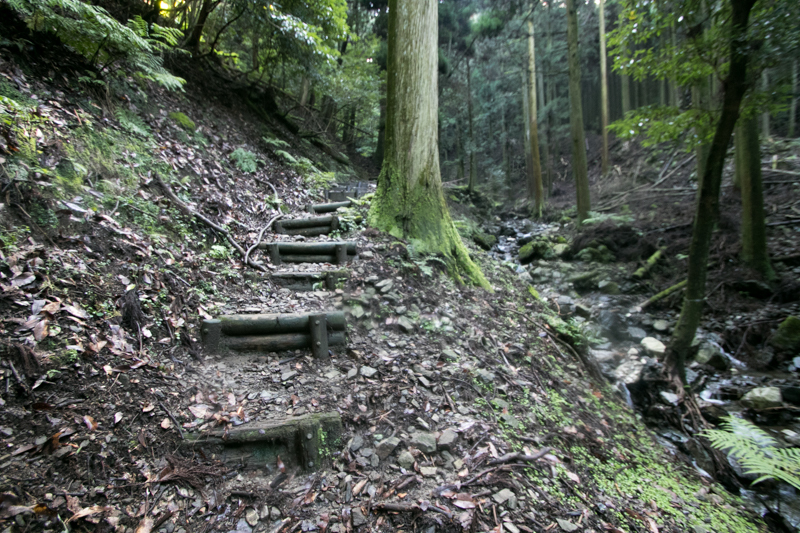 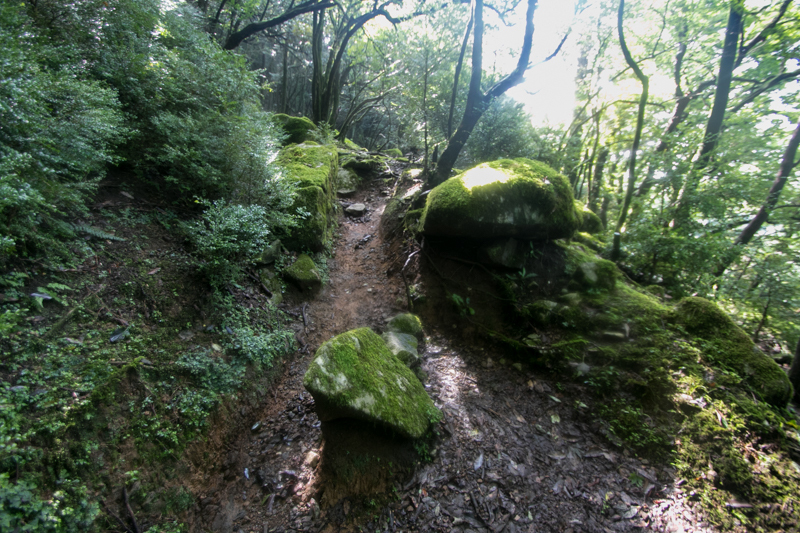 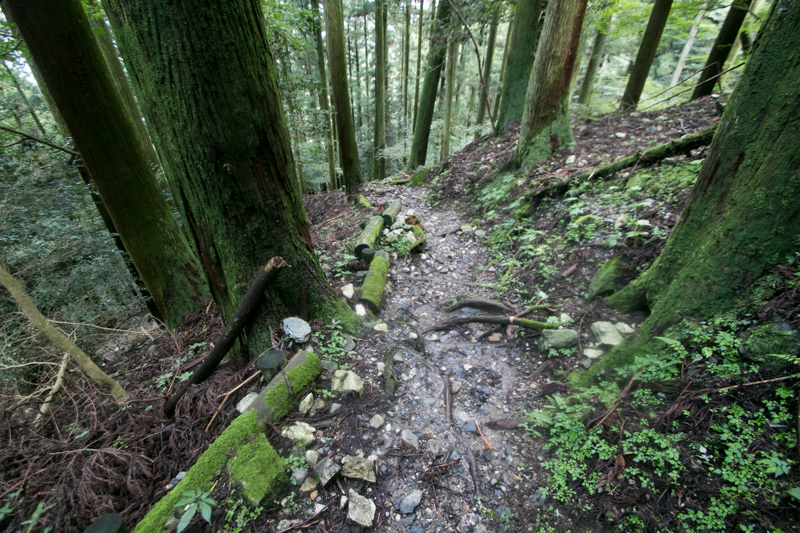 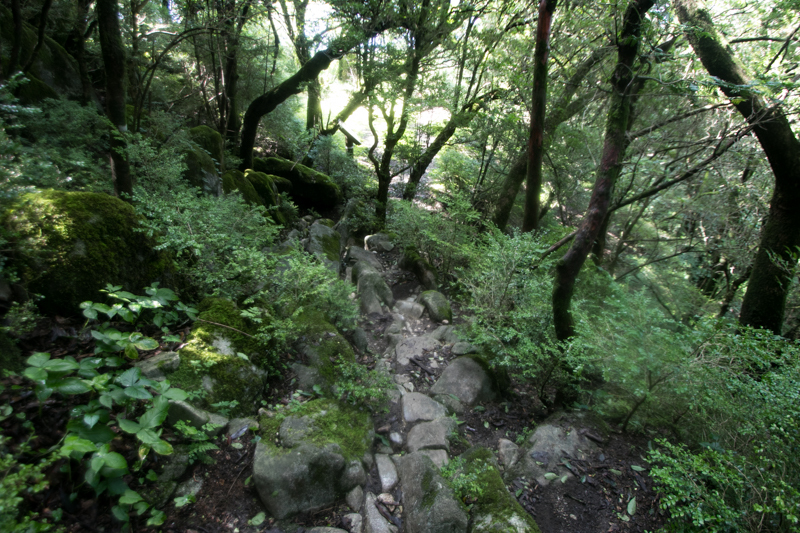 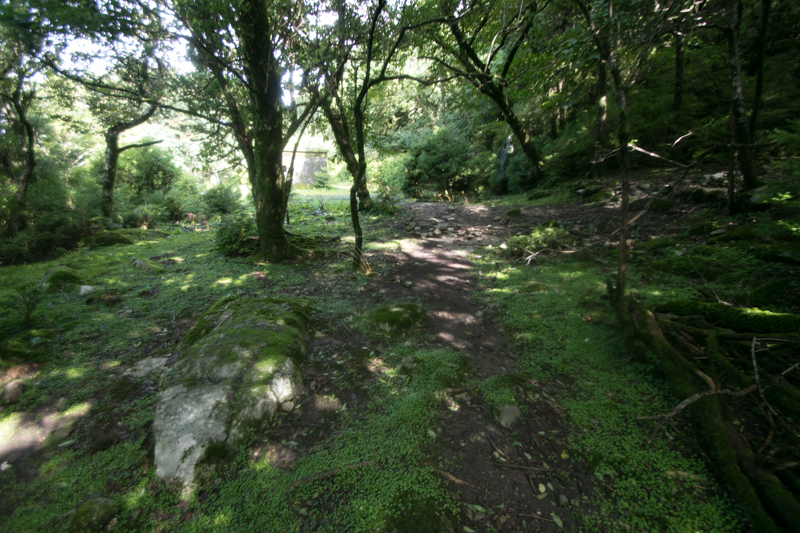 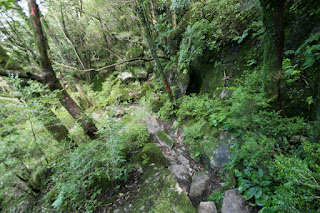 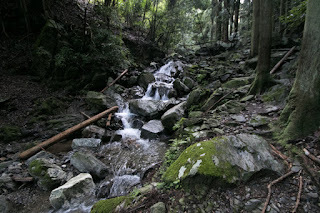 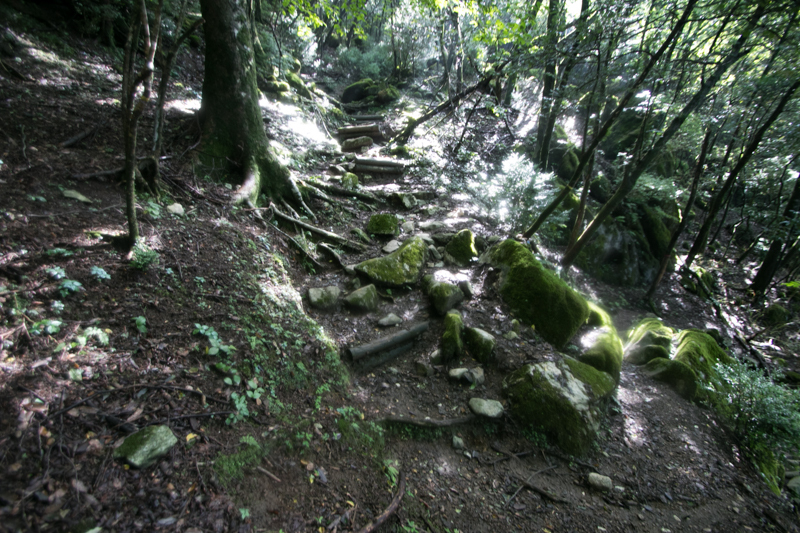 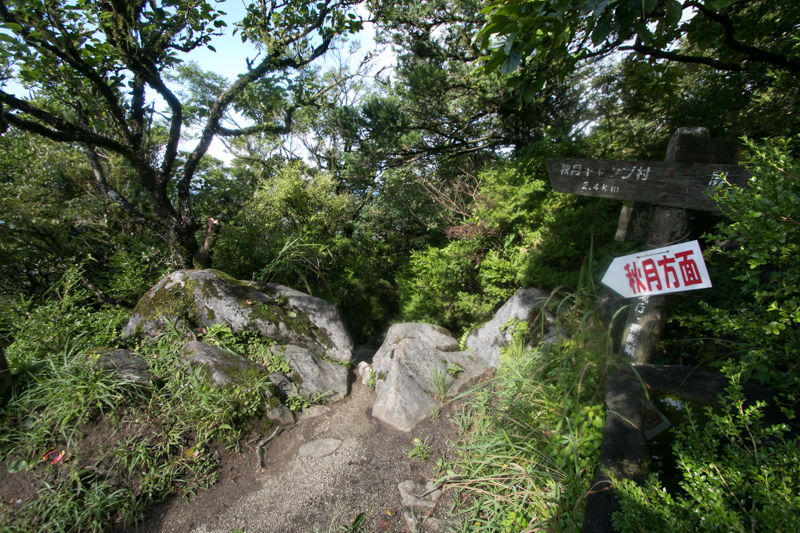 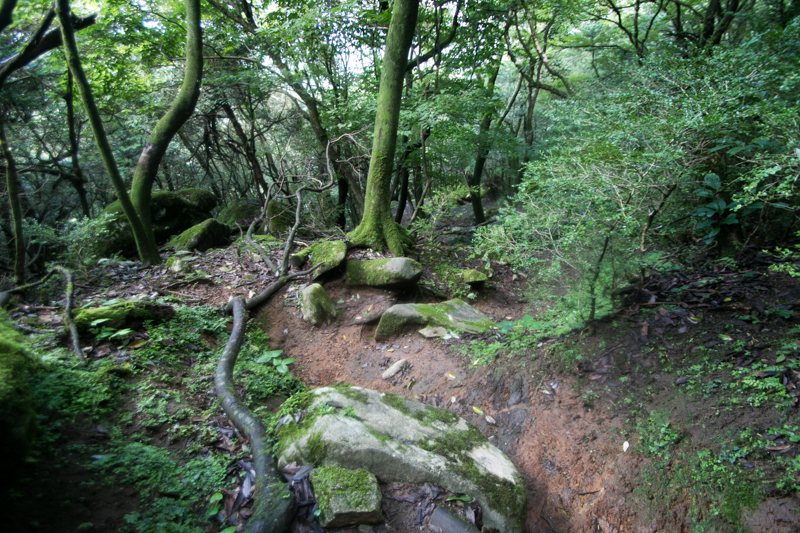 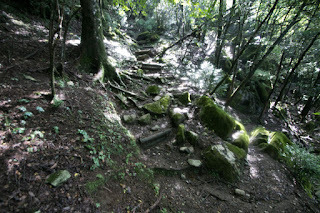 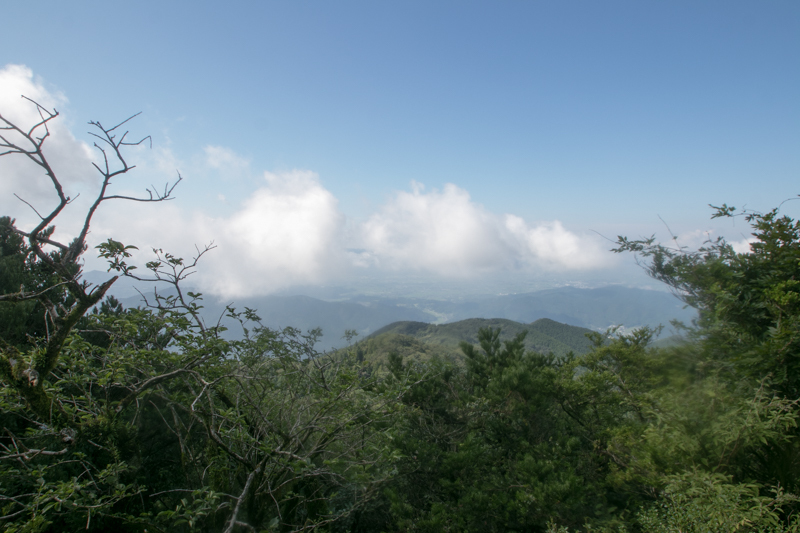 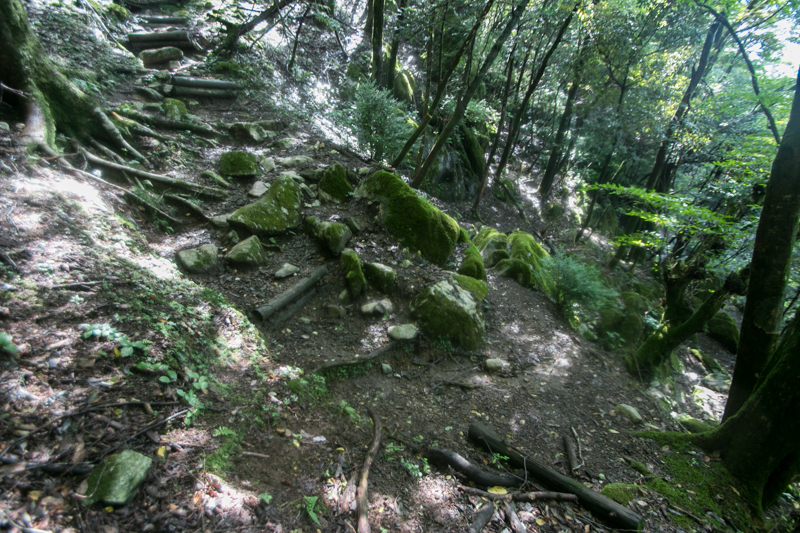 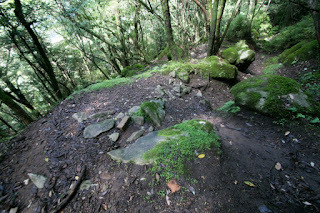 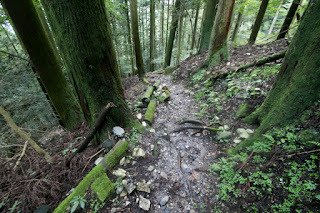 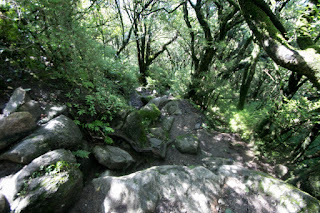 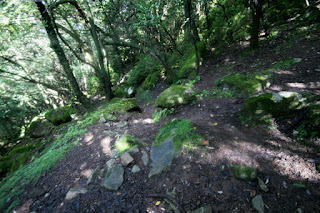 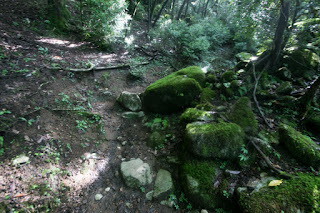 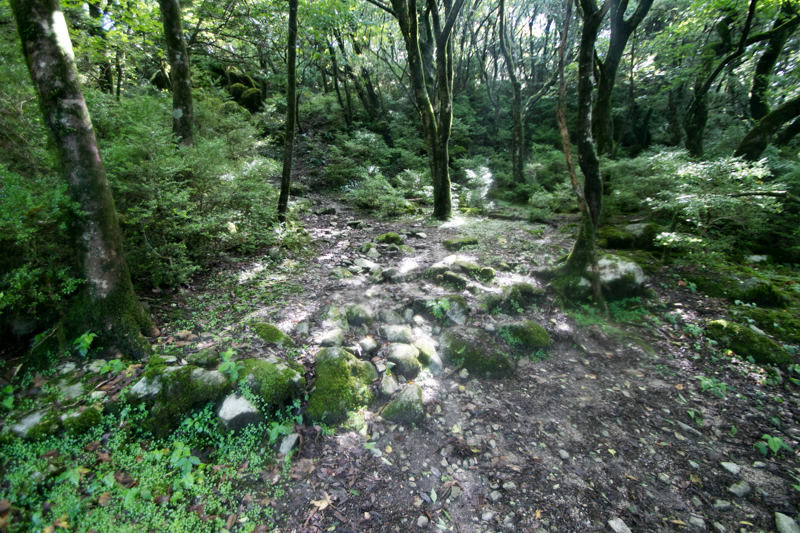 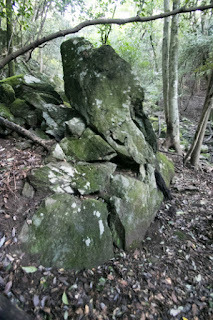 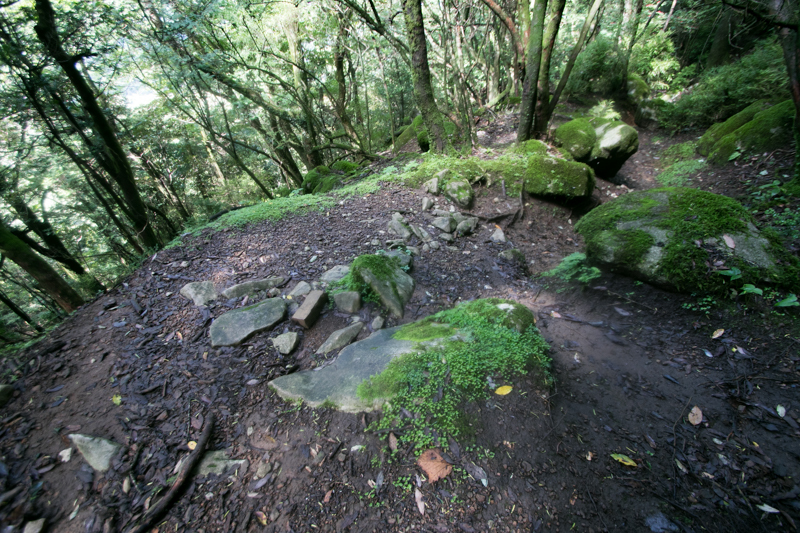 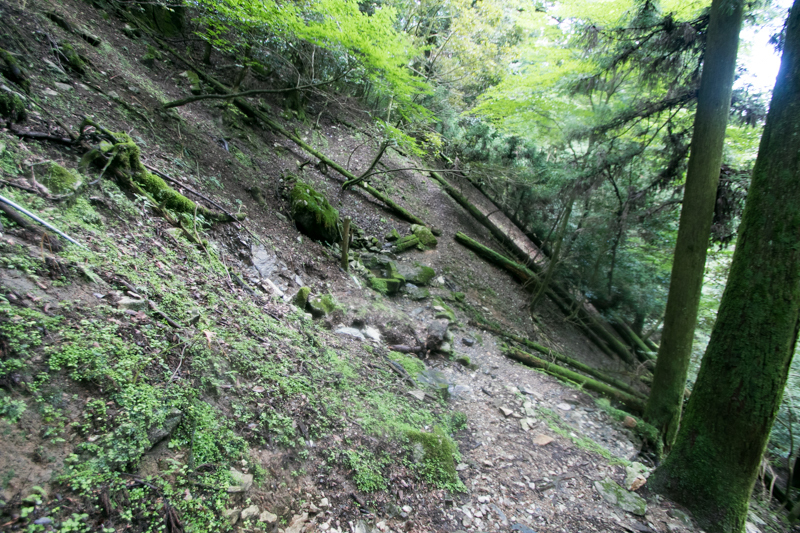 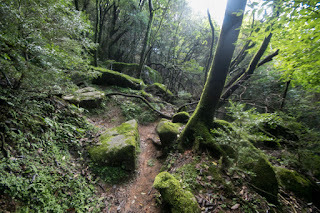 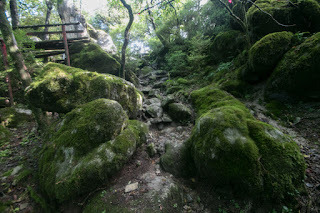 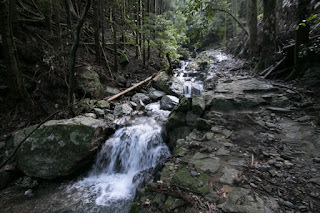 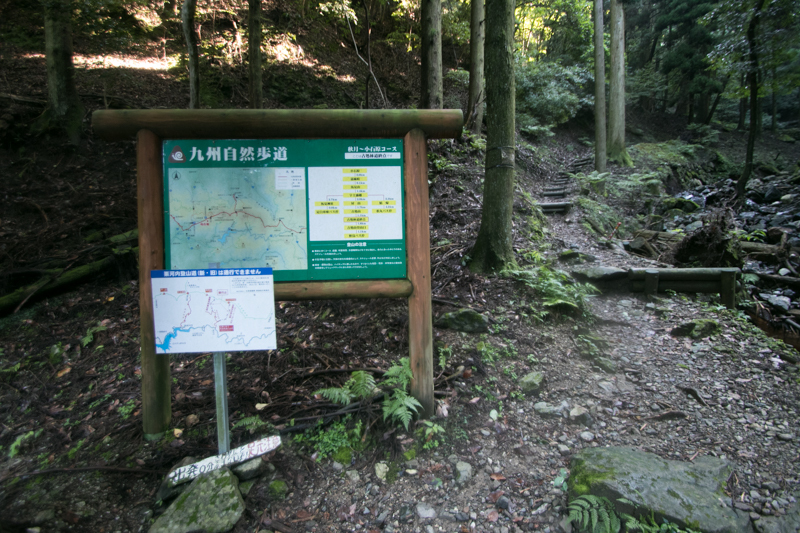 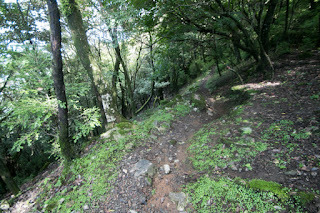 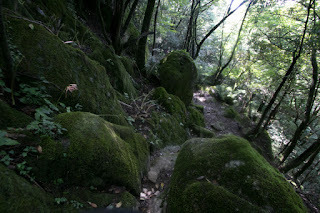 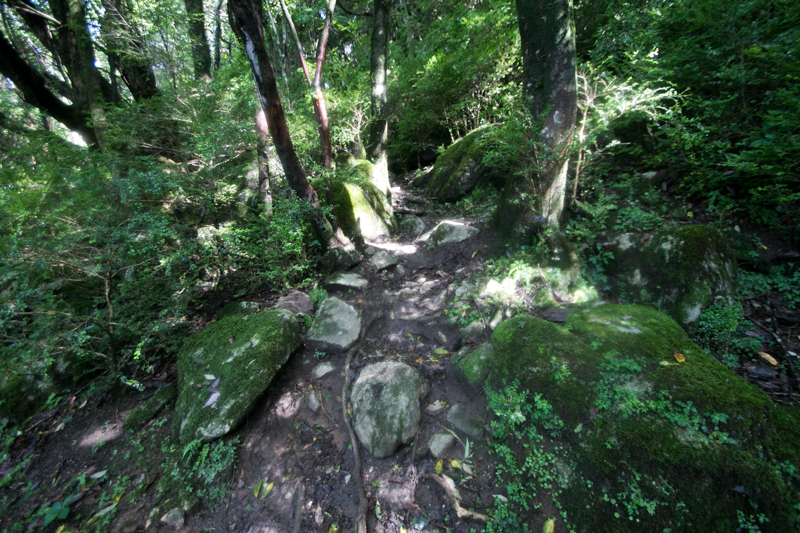 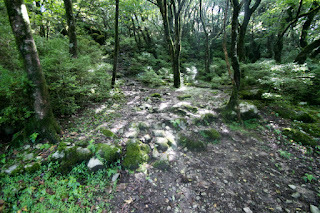 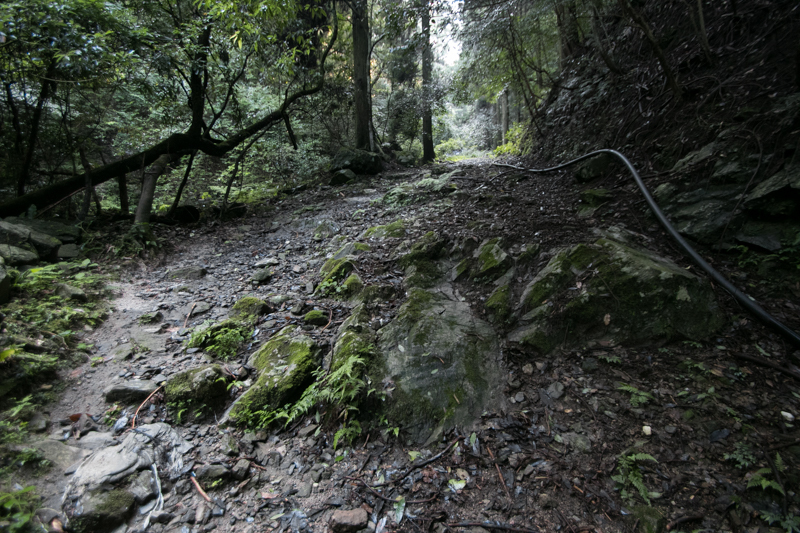 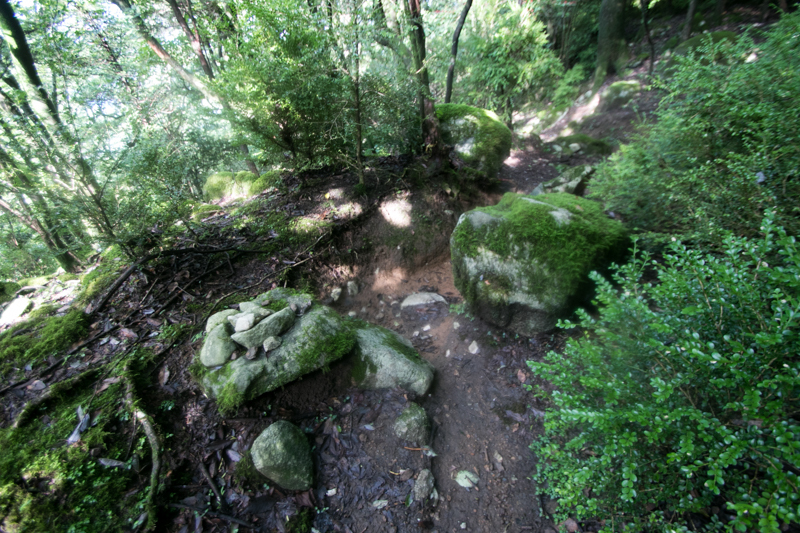 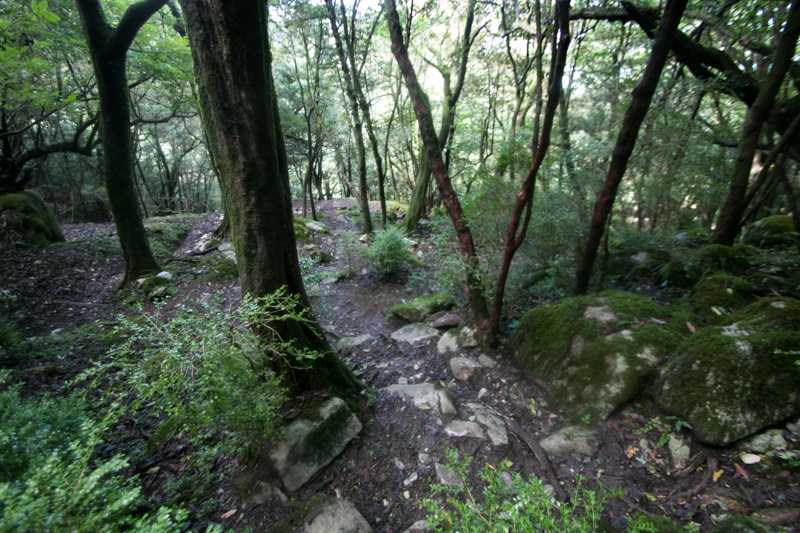 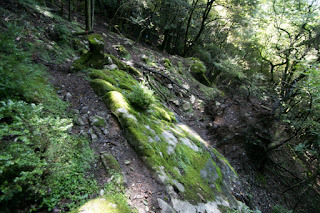 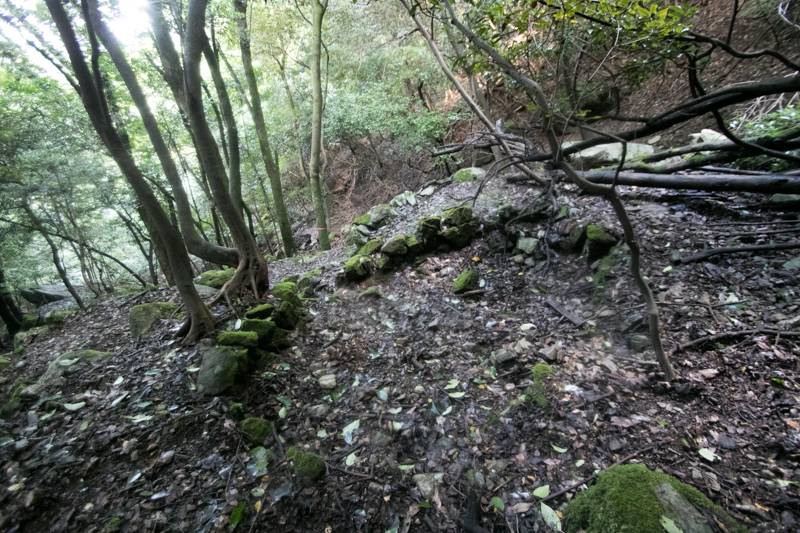 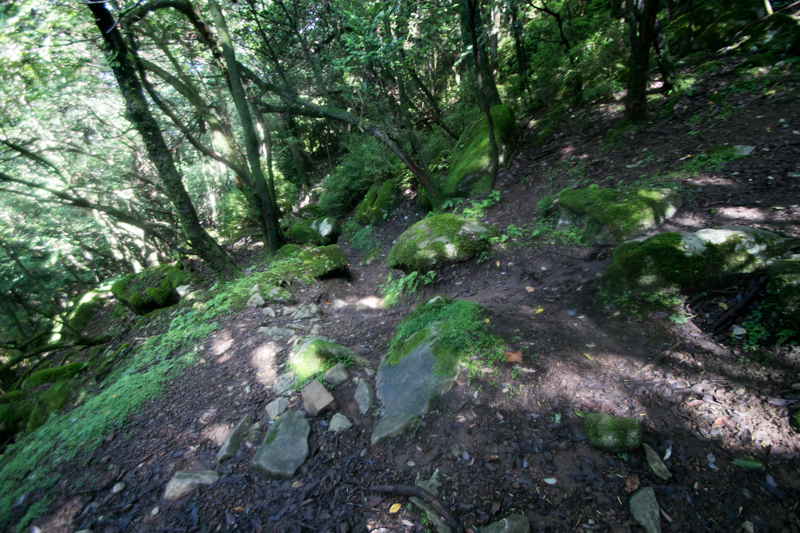 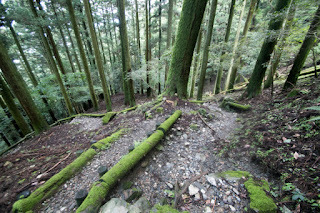 Castling and mountain hiking often overwrap in Japan, but Koshosan mountain is more recognized as a hiking course than the site of mountain castle. 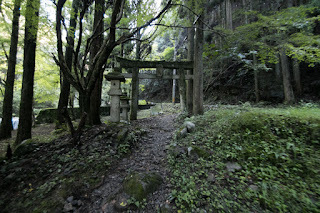 The most important factor of Koshosan castle is its extraordinary 700 meter height from hillside. 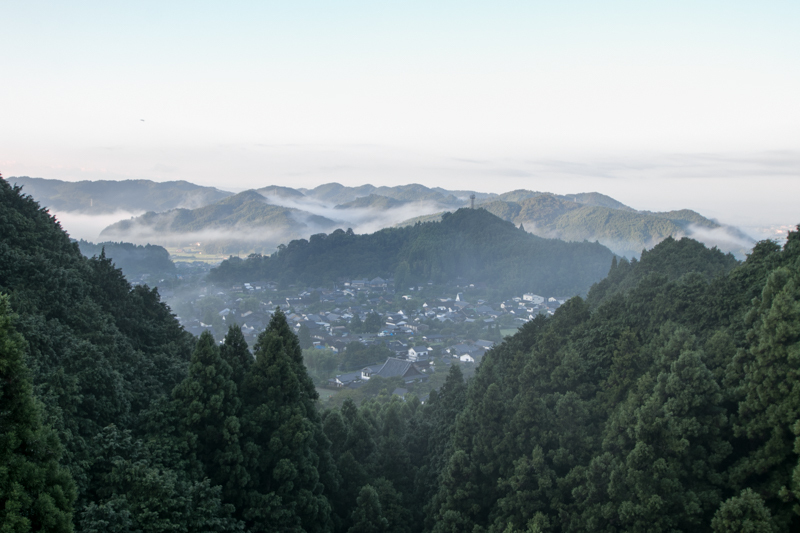 Of course there are many castles locate higher place at mountainous area, but even such castles height difference are limited within 500 meter. 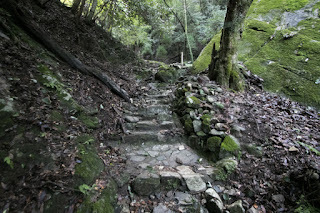 Furthermore, Koshosan castle was not a temporary fort or watching place but the main base of Akizuki clan, which temporally became the fourth strong power in Kyushu island. 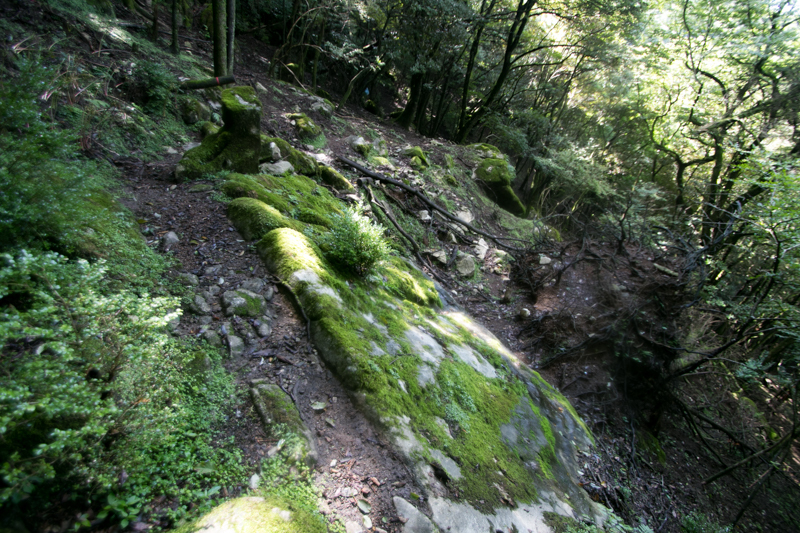 The origin of Koshosan castle is unknown but it might be built in 13th century by local lord Akizuki clan. The origin of Akizuki clan is also not clear but it might be a descendant of Haruzane Okura (?-? 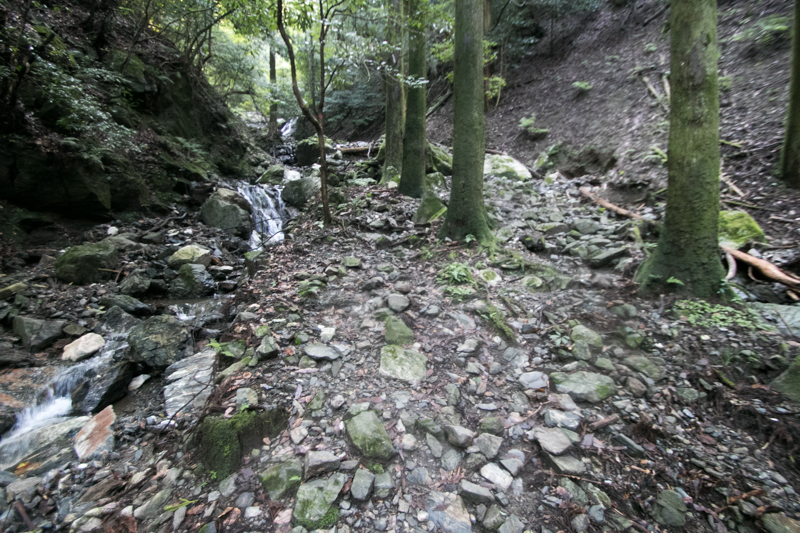 ), a central noble which ruined Sumitomo Fujiwara (893-941) who rebelled against central government at Seto-naikai sea in 10th century. 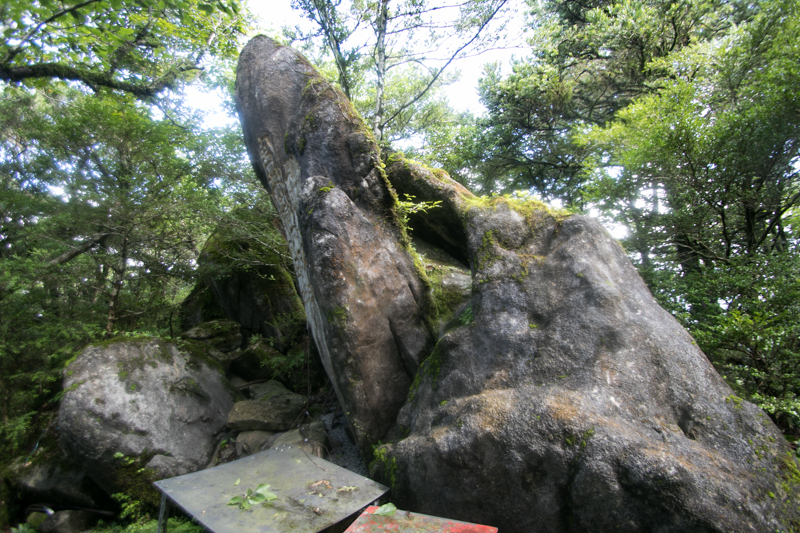 Later Haruzane moved to Kyushu island and became the retainer of Dazaifu city. Descendants of Haruzane became local lords under Kamakura Shogunate around current Fukuoka prefecture, including Takahashi clan at Homan castle, Harada clan at Takasu castle and Akizuki clan at Koshosan castle. Interestingly these three castles locate at sacred places of mountain worship. 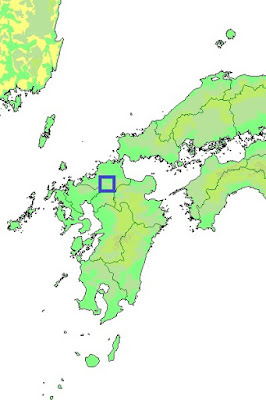 During Muromachi era, north part of Kyushu region had been a target of strong powers such as the South Court army, Shoni clan which had been the ruler in the Kamakura era, Ouchi clan which was the strong governor of Suo province and Nagato province (Yamaguchi prefecture), and Otomo clan reigned Bungo province (Oita prefecture). Facing this situation, Akizuki clan had to survive by changing their master. 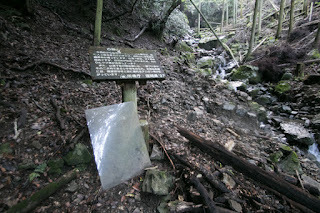 At first Akizuki clan belonged to the South Court army then turned to Shoni clan. 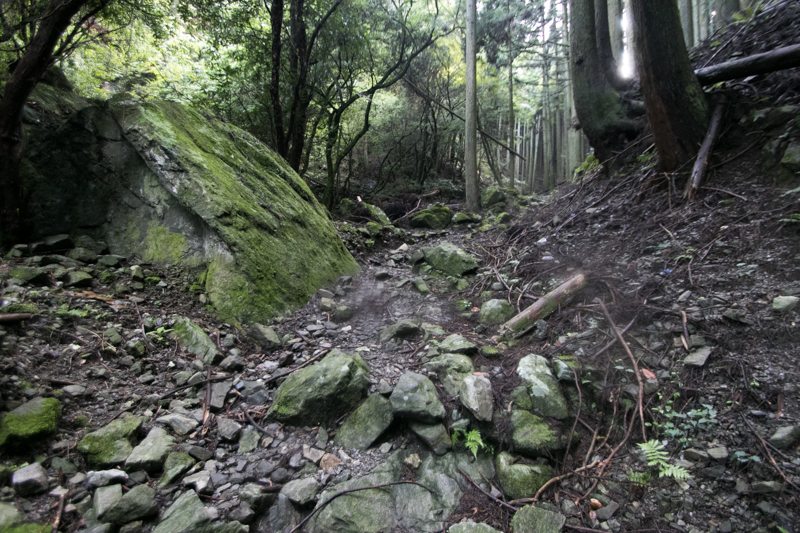 Then after the decline of Shoni clan, Akizuki clan became the retainer of Ouchi clan which seized north eastern part of Kyushu island and Hakata port. 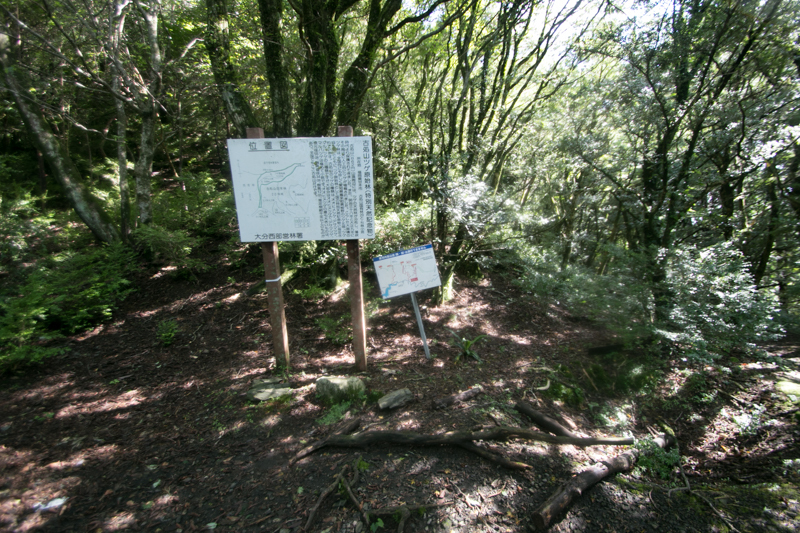 Under Ouchi clan, Akizuki clan became the important local lord and contributed to the agreement between Ouchi clan and Otomo clan. But in 1551, Ouchi clan suddenly ruined by the coup d'etat of their general Harukata Sue (1521-1555), then Akizuki clan which lost their master decided to followe to Otomo clan. However, in 1557, Mouri clan which ruined Harukata Sue and became the successor of Otomo clan proceeded to Kyushu island. 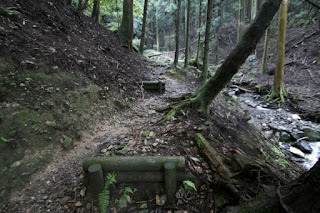 The territory of Akizuki clan was just on the way from Funai city, the main base of Otomo clan and wealthy Hakata port, then Akizuki clan held potential fear of territory confiscation by Otomo clan. 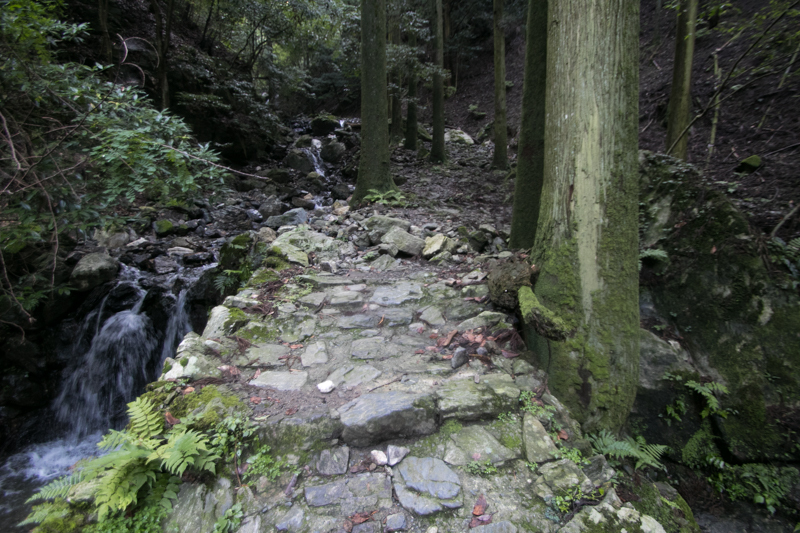 Looking at this situation, Motonari Mouri (1497-1571), an intelligent leader of Mouri clan, urged Fumitane Akizuki (1512-1557) , the leader of Akizuki clan, to leave Otomo clan. 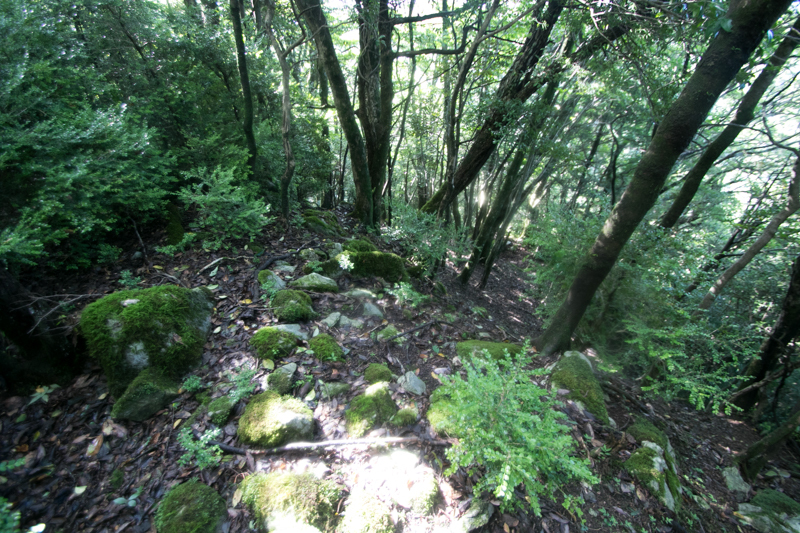 In 1557, Fumitane rebelled against Otomo clan and made besiege at Koshosan castle. 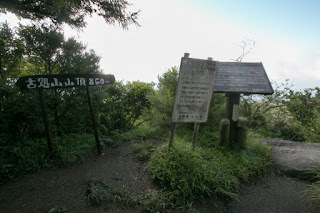 Facing the rebel of Akizuki clan, to keep connection to the north shore of Kyushu island, Otomo clan sent large army lead by Dosetsu Tachibana (1513-1585) and Akizumi Usuki (1520-1575), two of three chief retainers of Otomo clan. 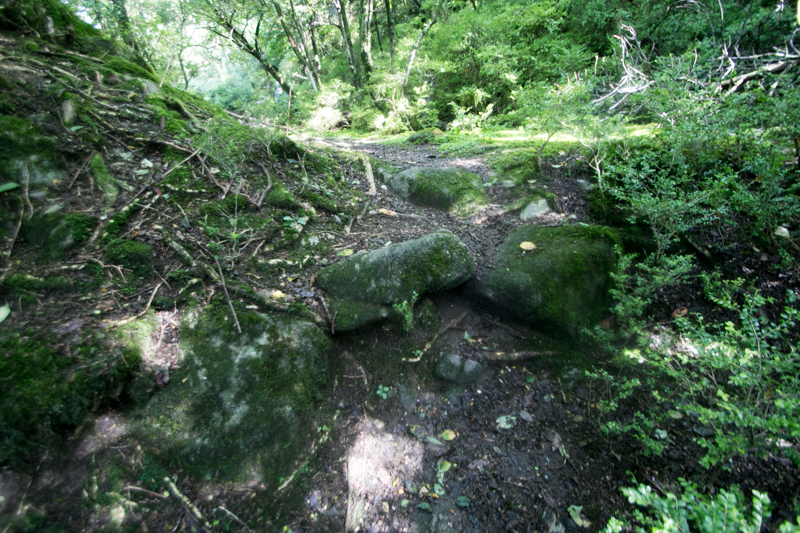 Fumitane strongly resisted against Otomo army at secure Koshosan castle, but Dosetsu securely surrounded Koshosan castle and steadily suppressed Akizuki army. 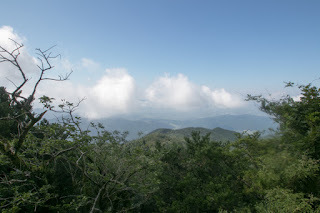 At this time approaching Otomo soldiers might be well seen from sky high castle. Finally Fumitane and his eldest son killed themselves and Koshosan castle fell before Otomo army. 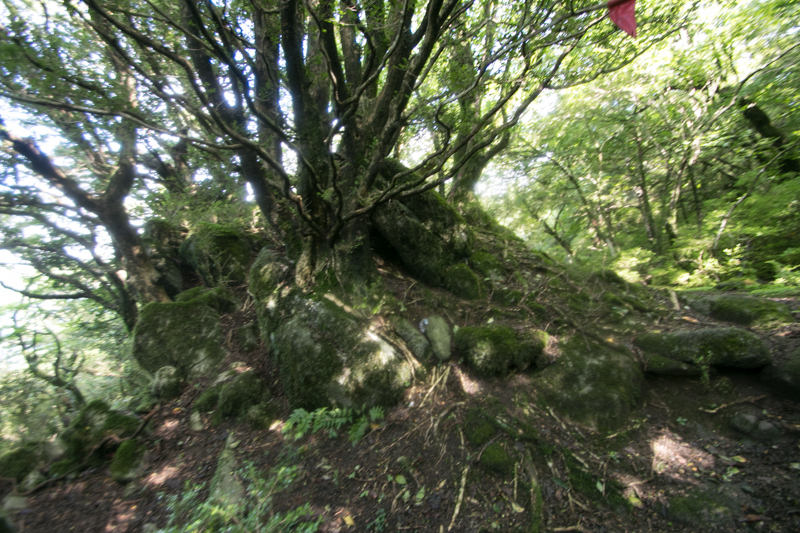 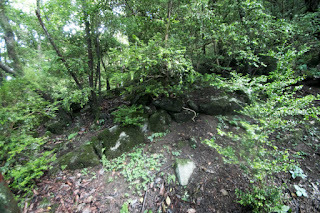 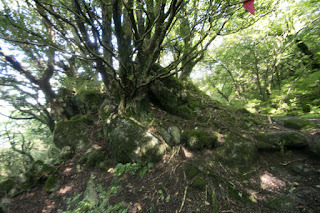 The height of the castle could not stop the siege of strong enemy, but remaining sons of Fumitane could escape from the castle then were hidden by Mouri clan and waited for the chance of return. 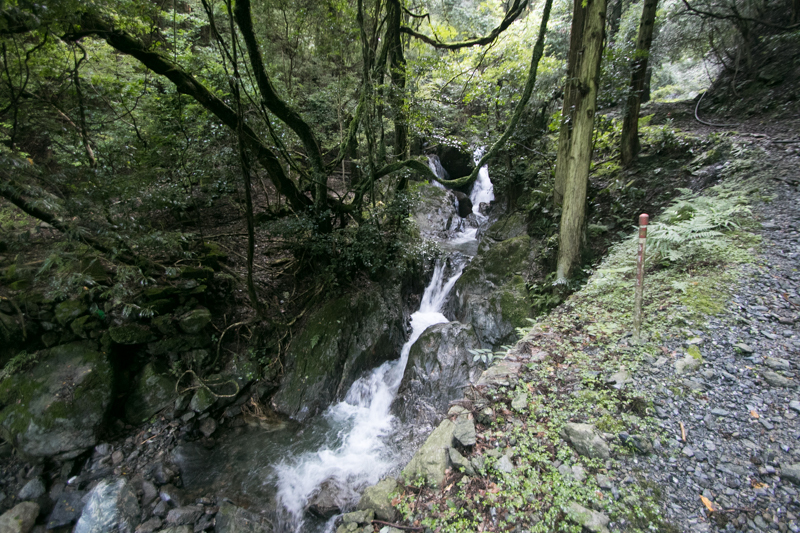 Just two years after the fall, in 1559, Fukae clan which was the retainer of Akizuki clan raised his army under the support of Mouri clan and captured Koshosan castle. 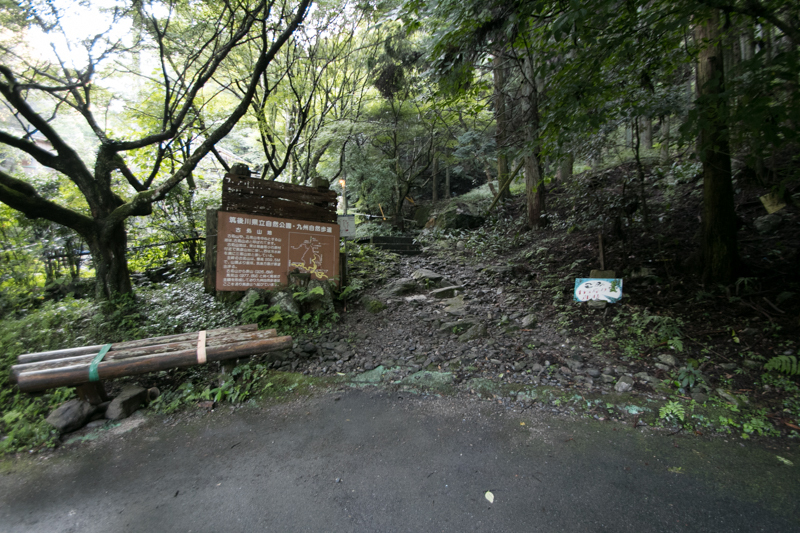 Tanezane Akinobu (1548-1596), the remaining son of Fumitane, returned to Koshosan castle and raised Akizuki clan again. 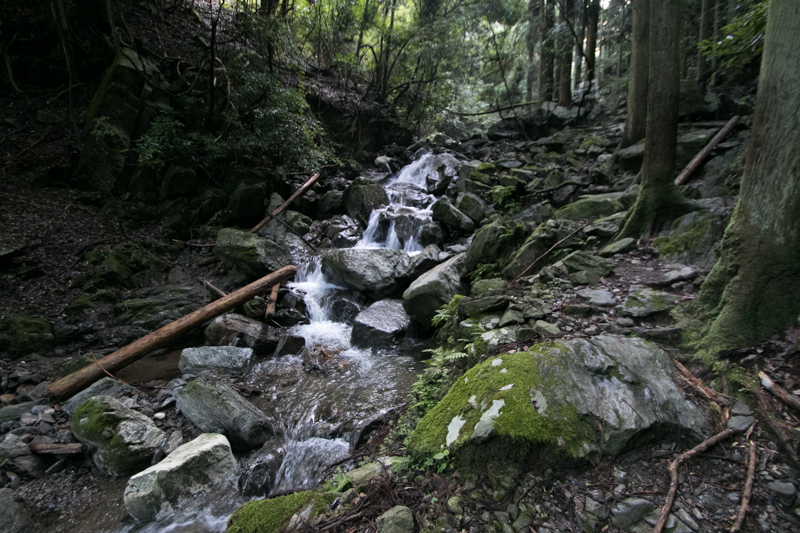 Under the support of Mouri clan Tanezane sent their younger brothers to surrounding local lords such as Takahashi clan or Nagano clan, and Akizuki clan grew to the lord of wide area held both of Kokura area and Chikuho area. 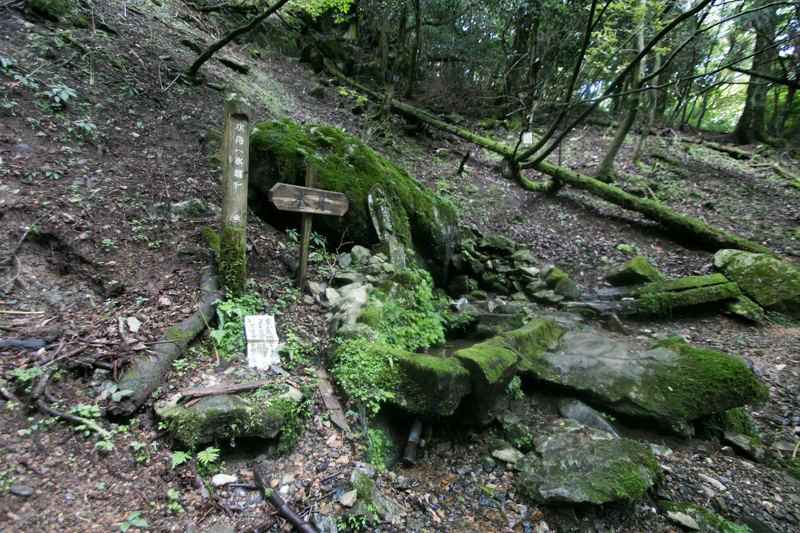 However, Mouri clan finally retreated from Kyushu island in 1569, Tanezane Akizuki once followed to Otomo clan. However, Otomo clan suffered severe defeat at the battle of Mimikawa before Shimazu clan which was the warlord of Satsuma province (Kagoshima prefecture), and significantly declined. 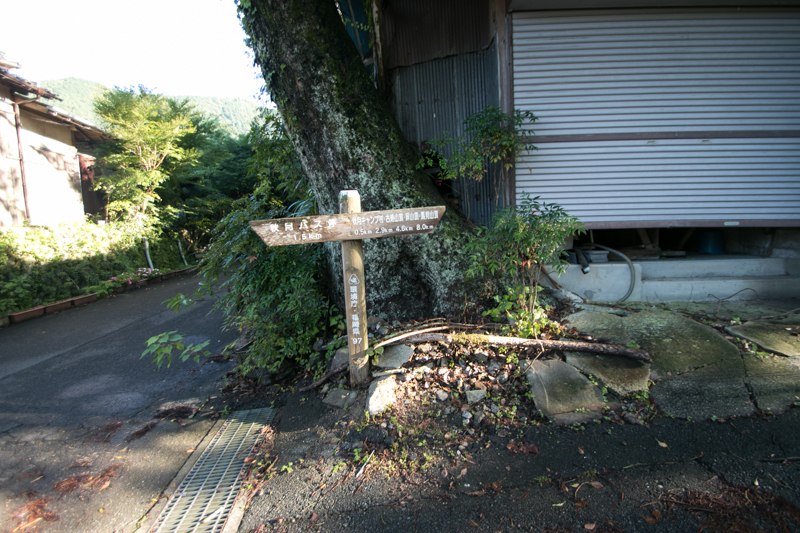 Looking at this situation, Tanezane Akizuki decided to leave Otomo clan and tried to become an independent power. 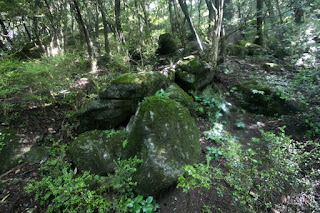 Tanezane Akizuki gathered surrounding local lords and rebelled against Otomo army. 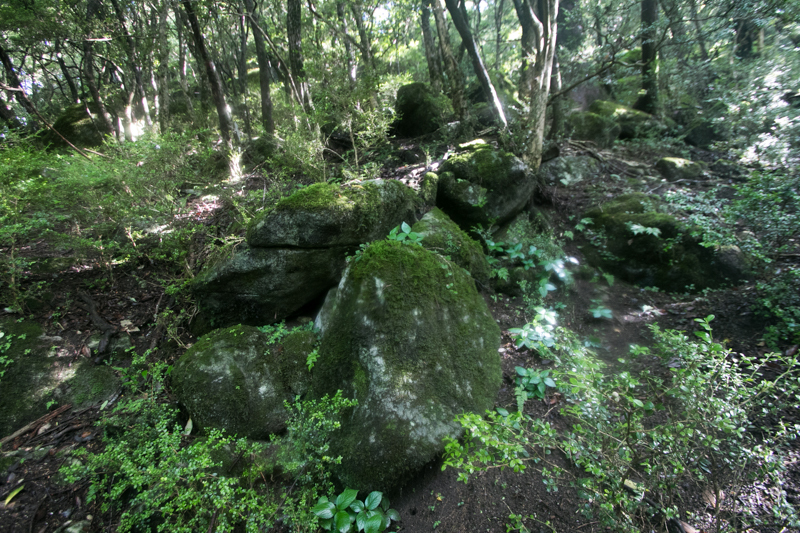 Otomo clan could not send reinforcement army because of their internal conflicts, but remaining Otomo army lead by Dosetsu and his colleague Joun Takauashi (1548-1586) once suffered severe defeat but had rejected attacks of Akizuki clan by smaller army. 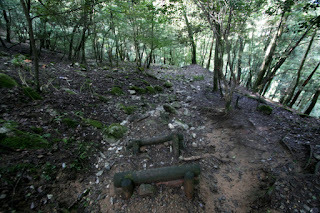 In 1585, Dosetsu Tachibana who kept desperate battle died in ill, and Otomo army lost their brave commander lost their will. Looking the loss of their enemy Akizuki clan further expanded their territory, and joined the attack of Iwaya castle kept by Joun Takahashi by Shimazu army. Shimazu army and Akizuki army fell Iwaya castle after half month battle but suffered severe loss by the brave command of Joun. 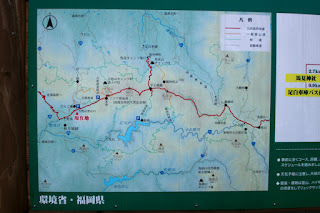 Shimazu army and Akizuki army next encircled Tachibanayama castle held by Muneshige Tachibana (1567-1643), the son of Joun and adopted son of Dosetsu. Shimazu army and Akizuki army already suffered severe loss could not attack the castle forcefully, and at this time Mouri clan which followed to central ruler Hideyoshi Toyotomi (1537-1598) landed to Kyushu island as a reinforcement to Otomo army. 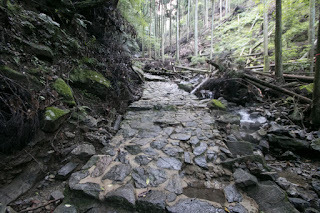 Looking at new enemy, Shimazu army and Akizuki army gave up the siege of castle and retreated. But both army suffered the defeat before the chase of Muneshige then returned to their enemy. 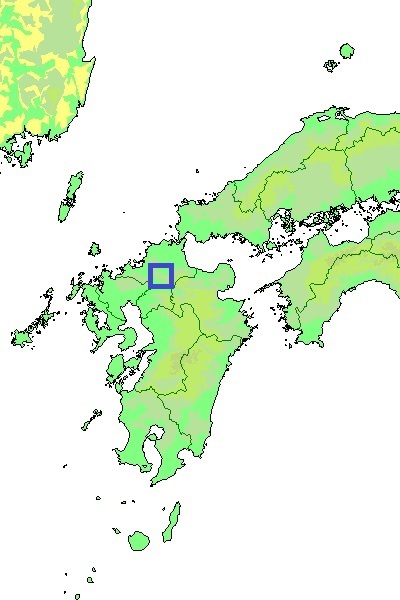 At this time the territory of Akizuki clan spread over the most part of eastern half of current Fukuoka prefecture and became the fourth power of Kyushu island . 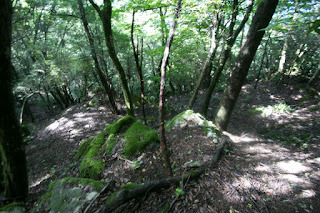 and the whole shape of vast territory might be seen from Koshosan castle. 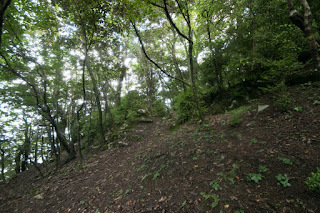 Koshosan castle spreads over the peak and surrounding ridge of Koshosan mountain. 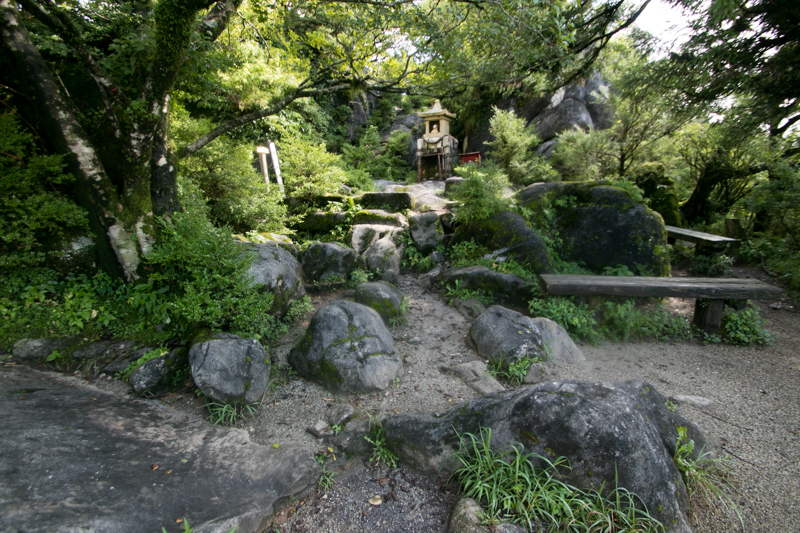 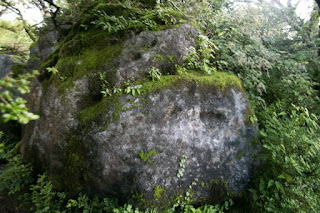 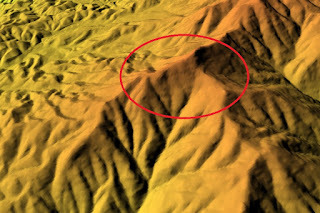 The peak of the mountain is a small flat space covered by huge rocks, and not appropriate to build large buildings. 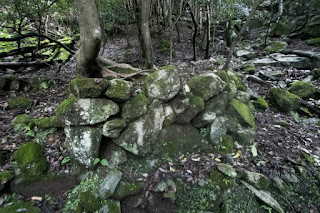 There might be a watching tower and originally might be used as a place of worship. Main part of Koshosan castle locates at the west form the peak. 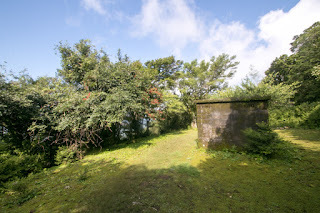 There is a narrow flat space of about 100 meter long and 30 meter wide called as a horse riding place, and there might be a main building of the castle. 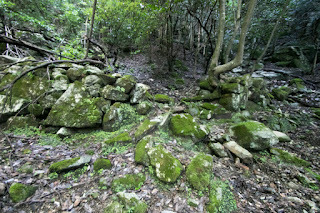 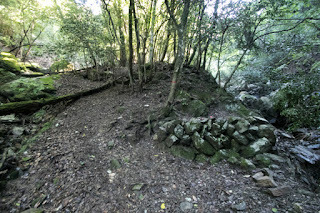 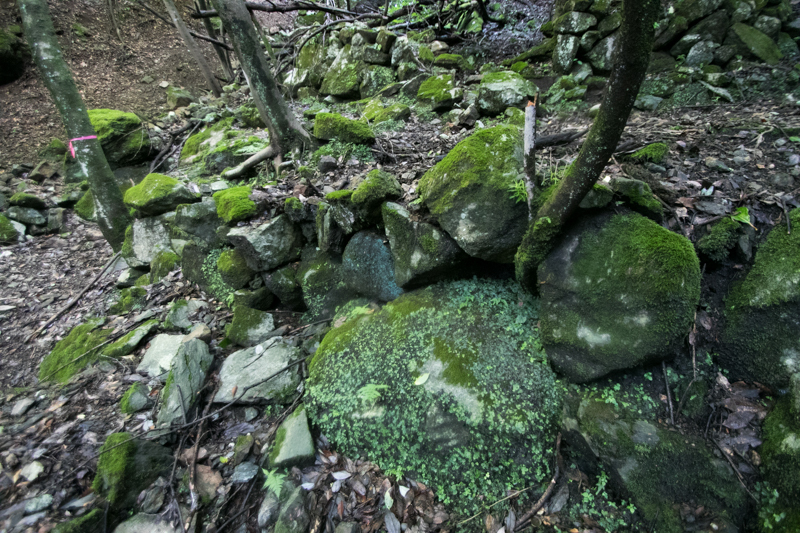 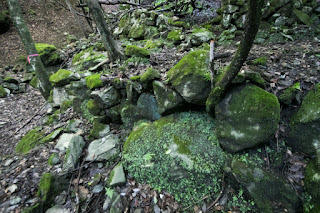 This part is secured by the line of vertical moats and small stone walls. 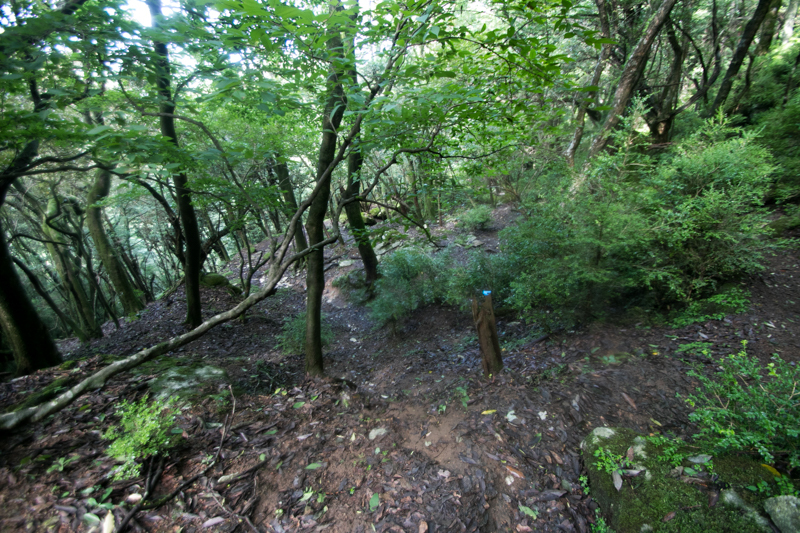 At the south of central area, ahead of saddle point there is Kyogamine fort. 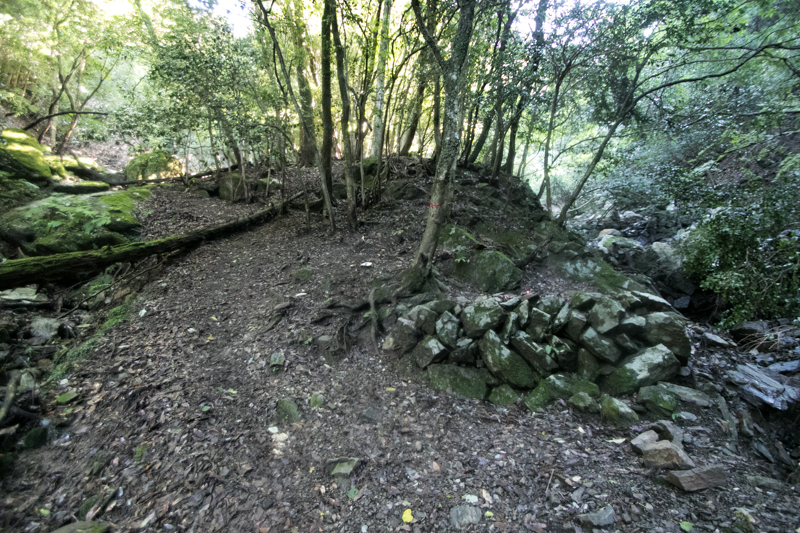 This part might be built at later period and had a combination of clearly shaped flat terraces of 100 meter long square and line of vertical dry moats. 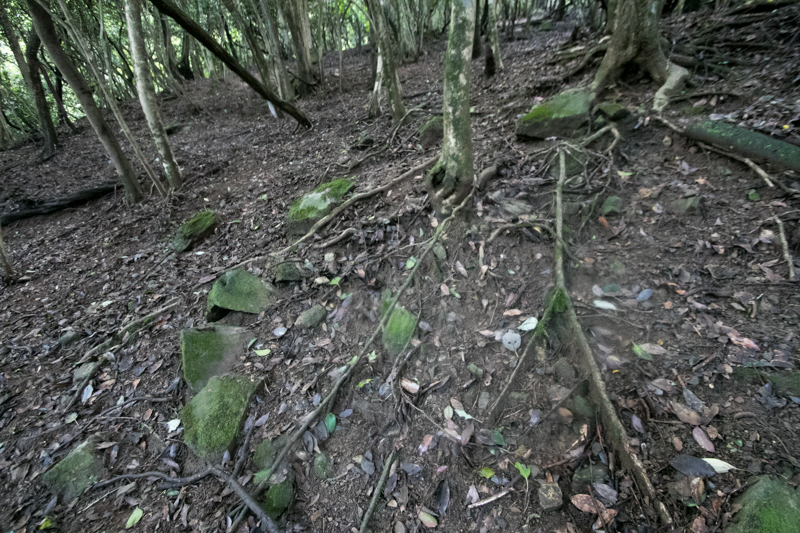 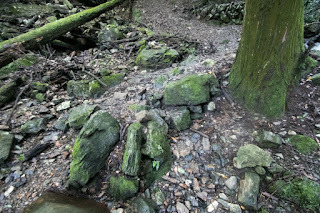 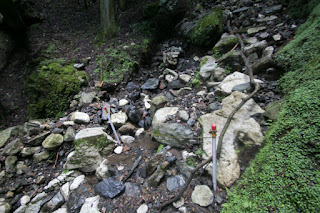 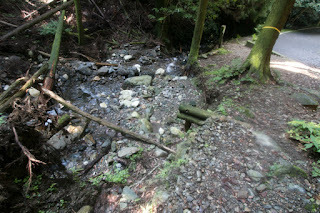 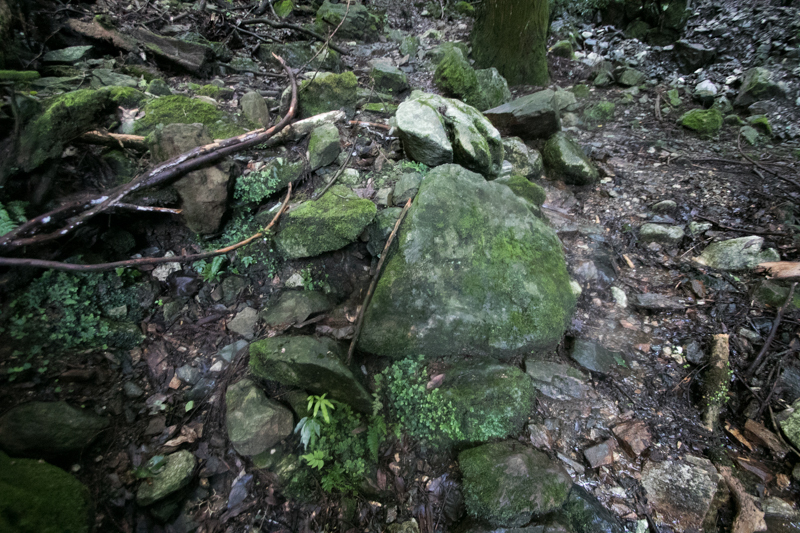 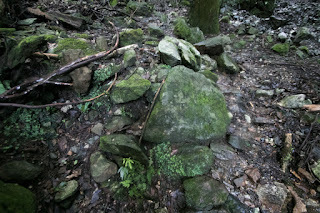 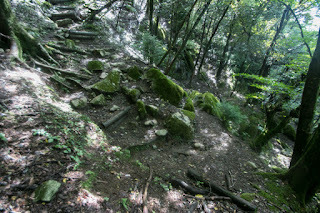 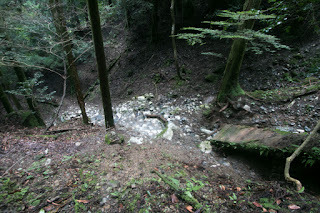 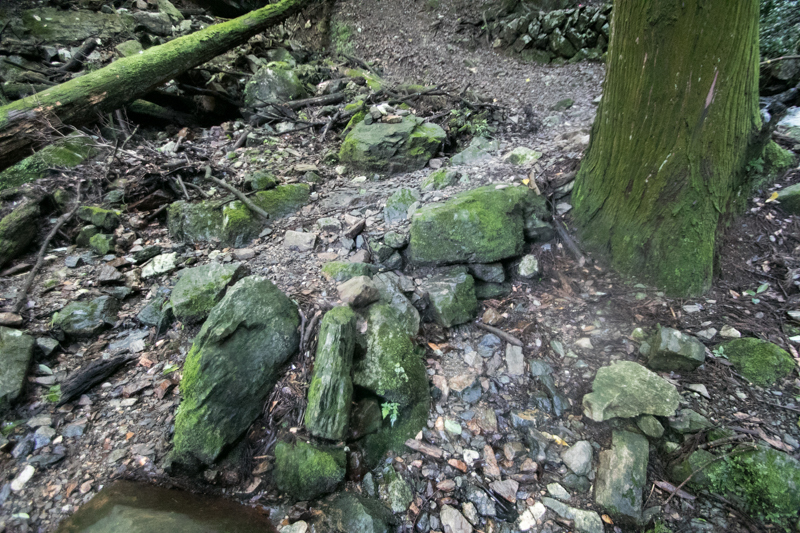 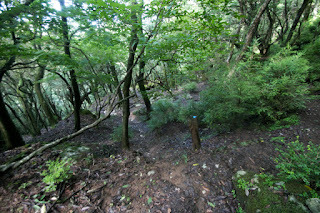 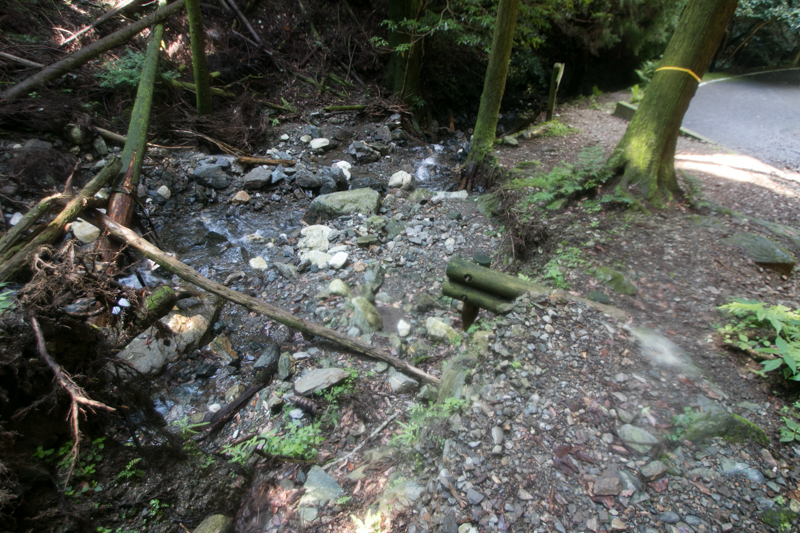 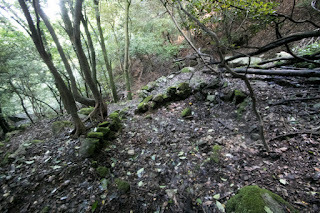 Just below the hilltop area there is a well named Mizubune still providing cold water, and there are many structures of the castle whole around the mountain. 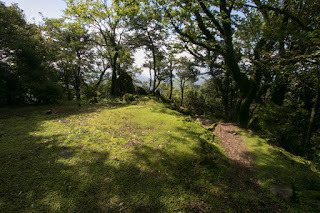 Koshosan castle was the main base of Akizuki clan but it was too inconvenient at such extraordinary high place; Thus Akizuki clan also built Arahira castle at hillside for daily use. But Koshosan castle was a secure main base built based on the hard history of the clan. 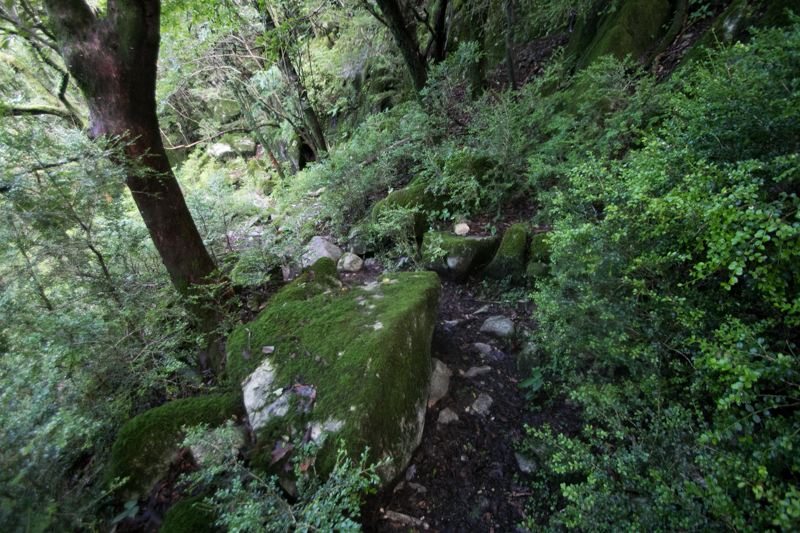 Along with secure main base and vast territory, Akizuki clan experienced its peak period after troubled history. 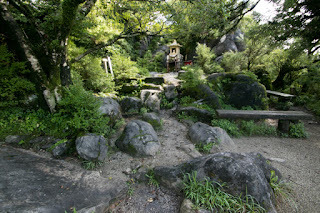 But Tanenaga had to prepare for the invasion of Hideyoshi expected soon. 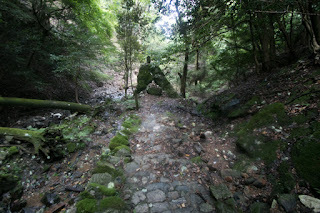 In 1587, Hideyoshi ordered expedition to Kyushu island, the landed to Kokura castle already fell by Mouri army. 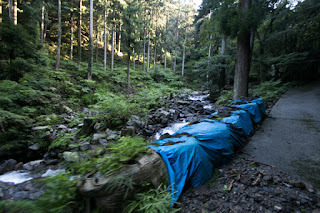 As Shimazu army already retreated from Otomo territory and concentrated to the defense of their territory, Tanenaga had to face against overwhelming army of Hideyoshi only by himself. The main army of Hideyoshi at first attacked Ganjaku castle which located at eastern edge of Akizuki territory. 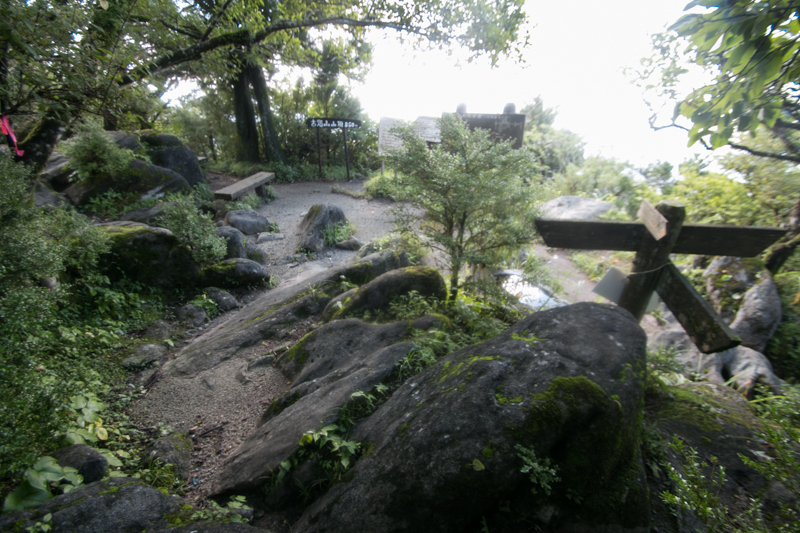 Ganjaku castle was a secure one built over rocky mountain, but Hideyoshi made forcible attack by overwhelming army and fell it in only one day. Tanezane stayed at Masutomi castle at the center of his territory and looked the situation, then gave up the resist at Masutomi castle and besieged at Koshosan castle. 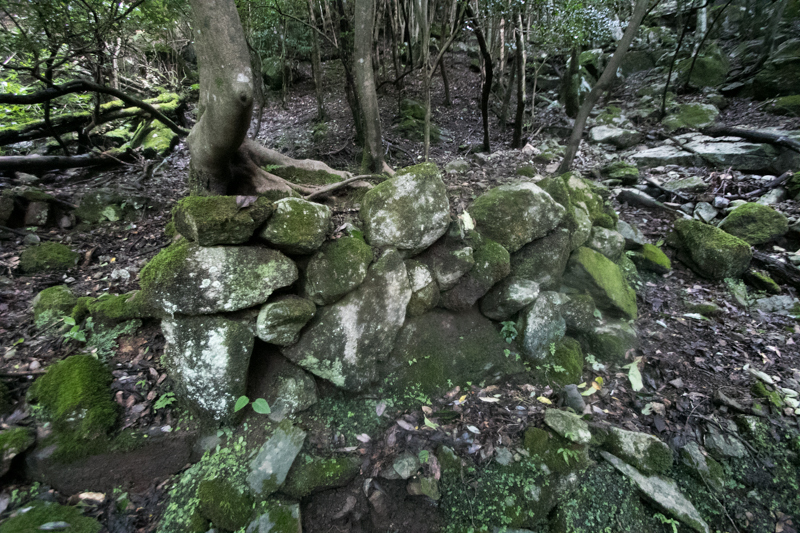 Hideyoshi occupied broken Masutomi castle, then built the fake walls by wood and paper at Masutomi castle to show toward Koshosan castle. Tanezane was shocked by one day fall of Ganjaku castle and one day build at Masutomi castle, and accepted the inferior situation. 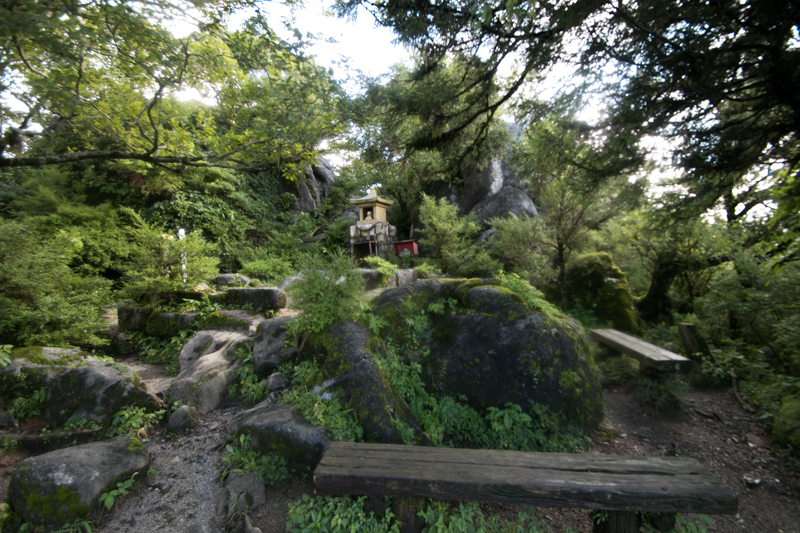 Tanezane became monk and left Koshosan castle with his son Tanenaga Akizuki (1537-1614), then surrendered to Hideyoshi by providing his famous tea set "Narashba". Hideyoshi saved Tanezane and Tanenaga but ordered to move to Hyuga province (Miyazaki prefecture) and continued as the feudal lord of Takanabe castle. 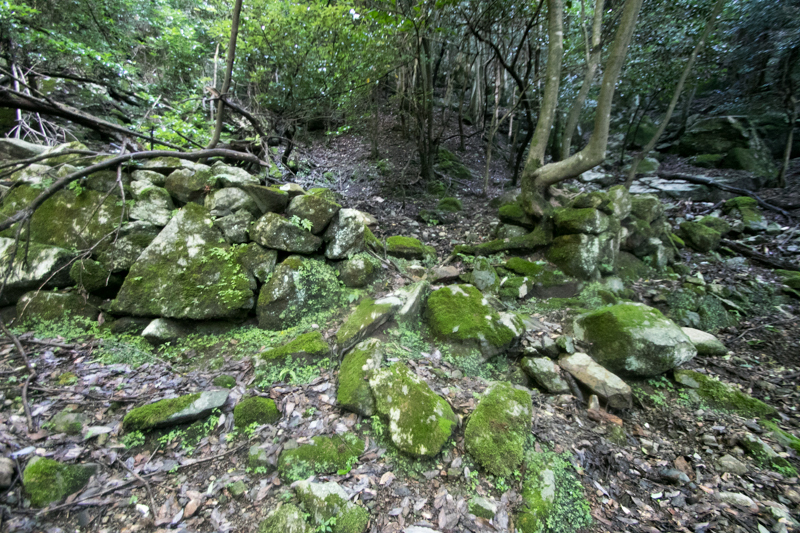 Koshosan castle was abolished at this time, but later Akizuki area became the territory of Akizuki domain, the sub-domain of Fukuoka domain then Akizuki town kept as a castle town. 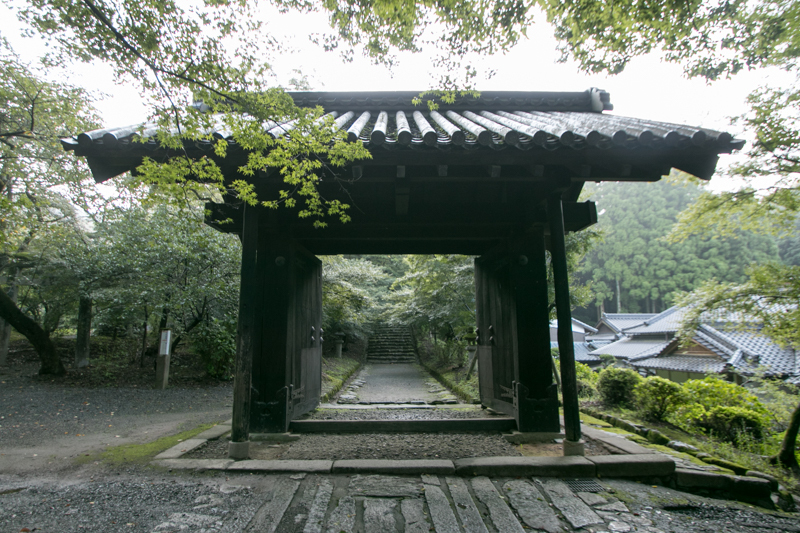 Now all building of the castle was lost but the remaining main gate of Akizuki Jinya castle is said as the one of Koshosan castle. 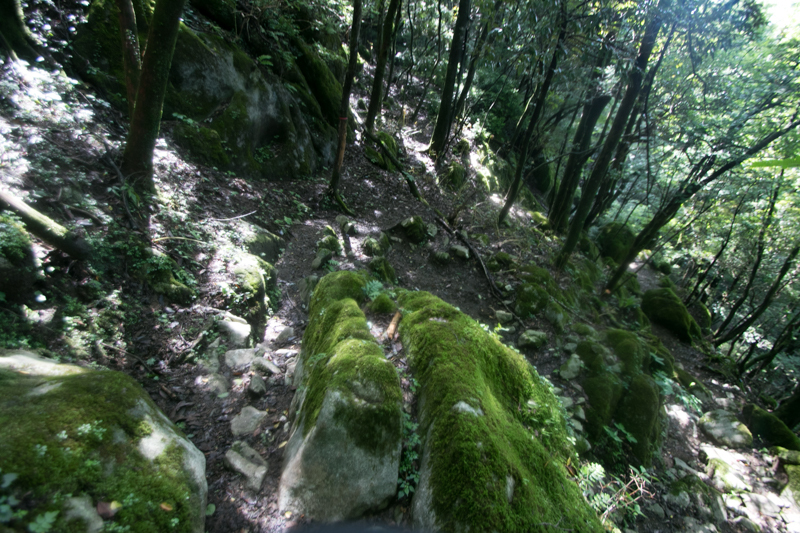 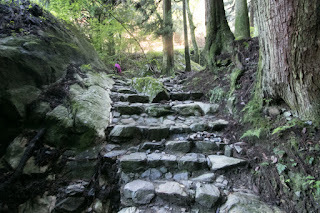 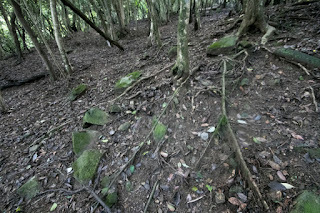 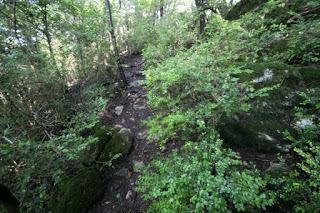 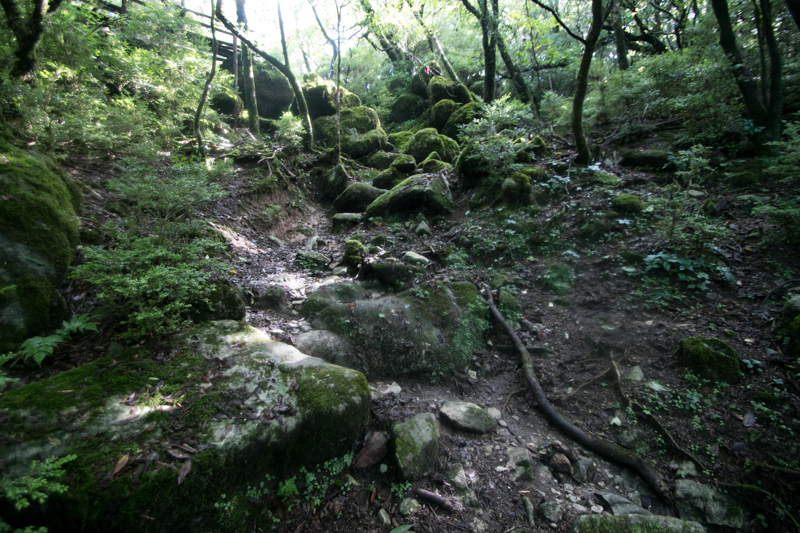 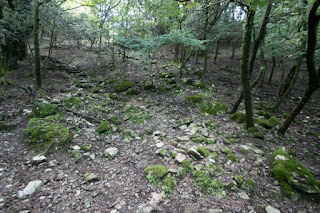 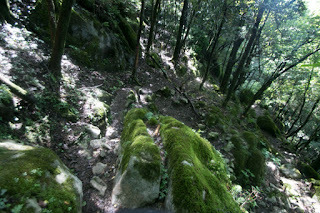 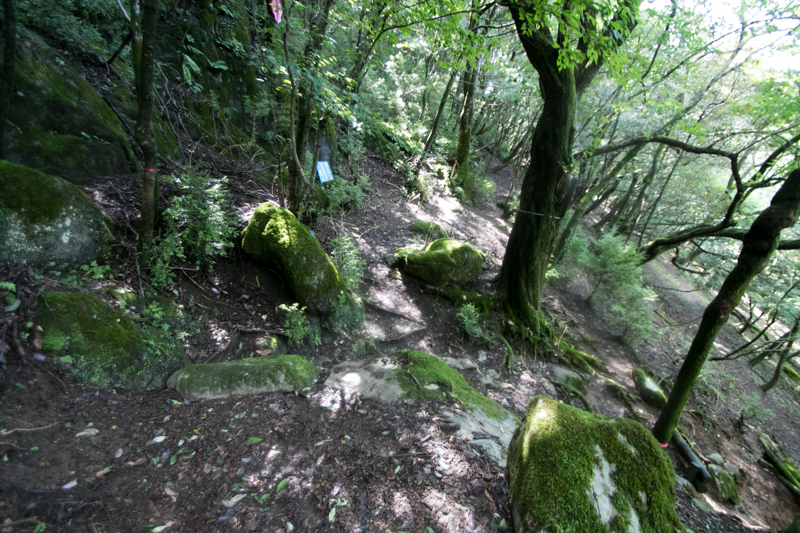 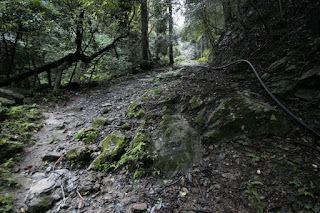 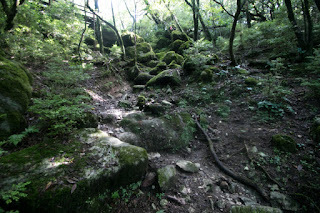 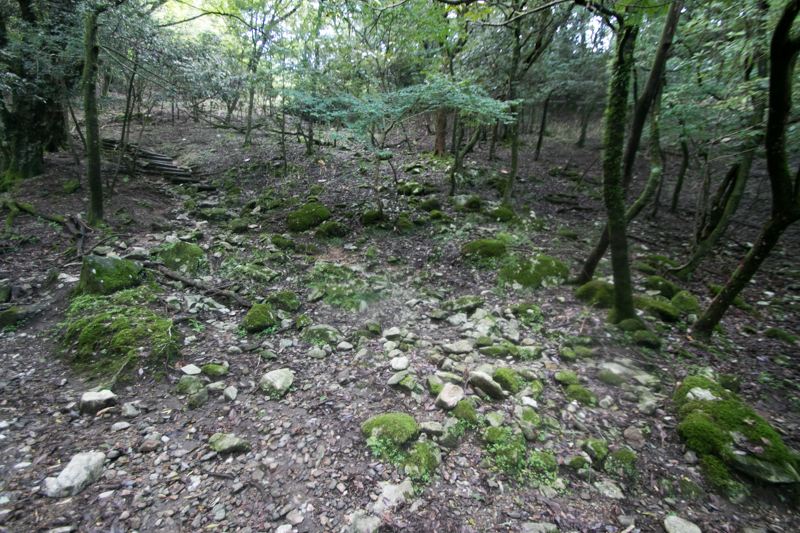 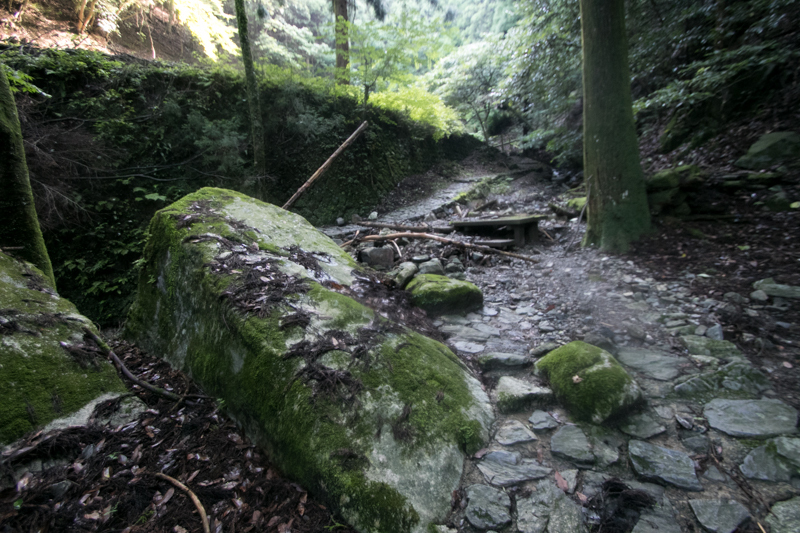 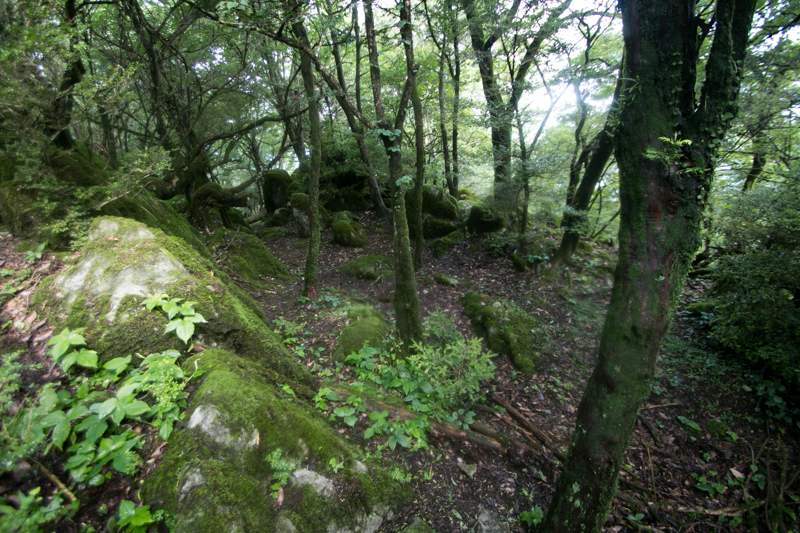 The remnants of the castle is not so clear because of rocky ground, and it is quite hard to climb to the castle because of the close of convenient forest road. 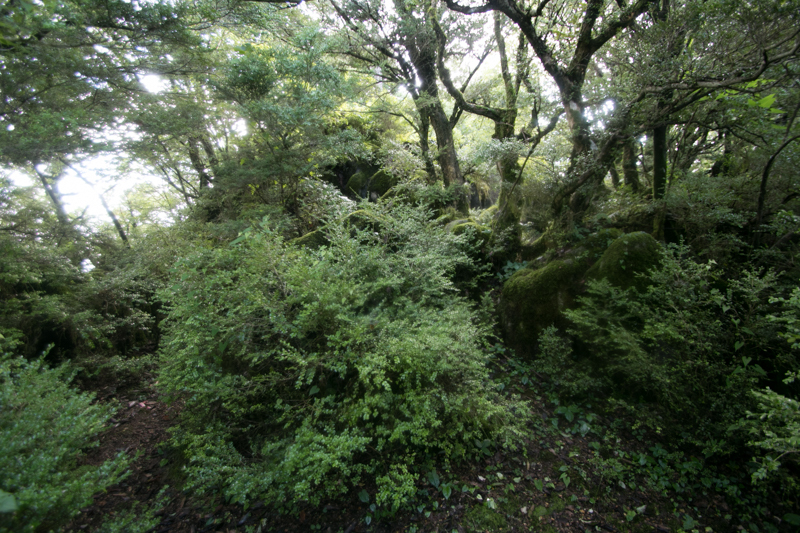 But magnificent scenery of the area seen from castle site reminds both of the vast territory of Akizuki clan and fear of approaching strong enemies. 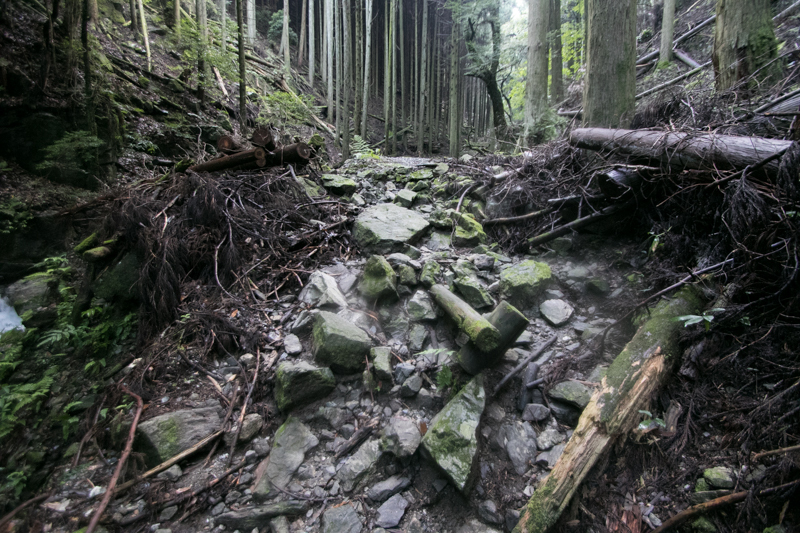 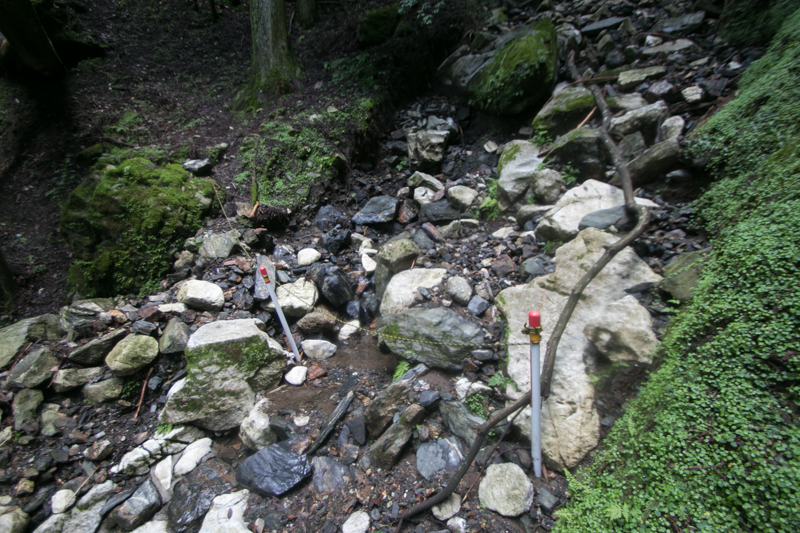 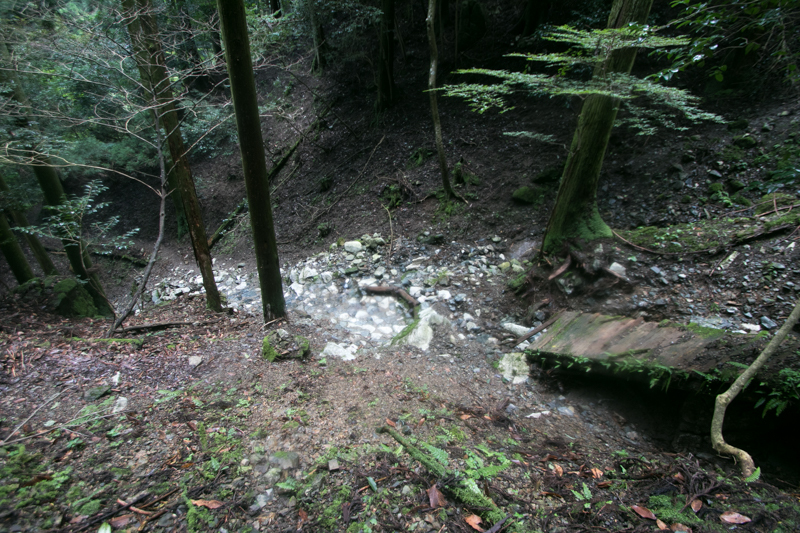 Because of heavy typhoon in the summer of 2017, climbing road of Koshosan mountain heavily collapsed at that time. 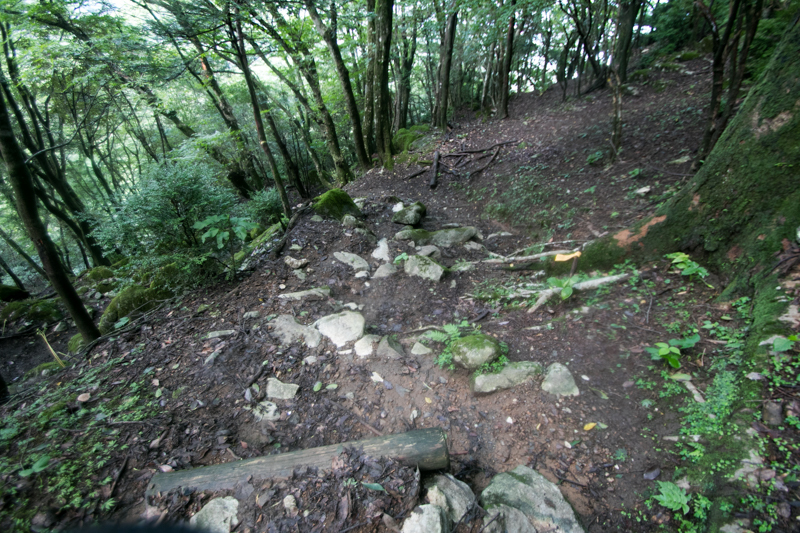 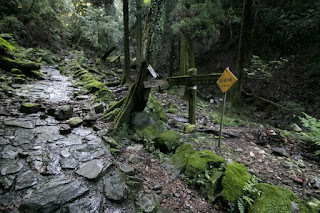 As of August 2017, it was impossible to pass forest road to the halfway of the road by car, and it became difficult to trace climbing road after intermediate point. 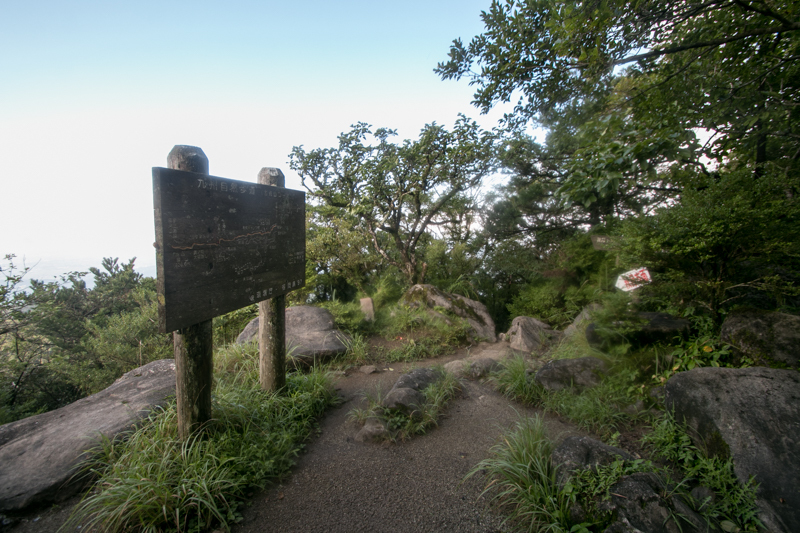 Visitors should be careful for these matters. 150 minutes walk from entrance of climbing road at the inside of Akizuki town. 30 minutes drive from Oita Jidoshado Expressway Amagi interchange to the entrance of climbing road.